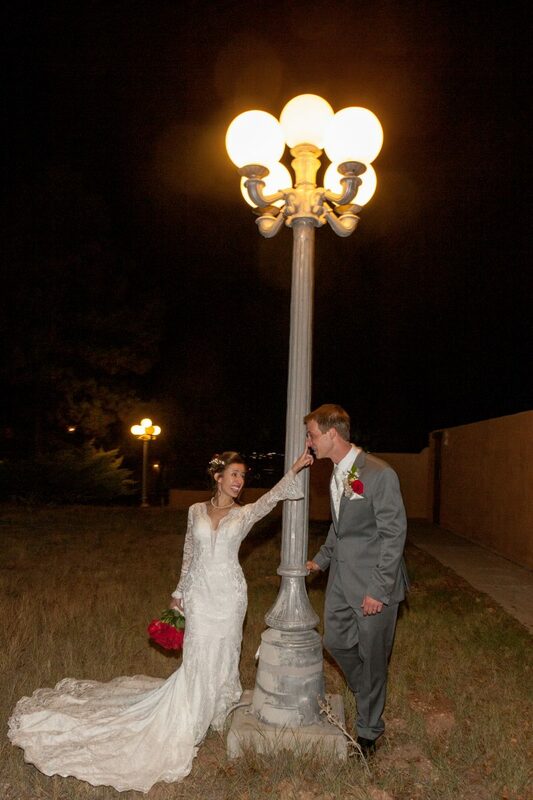 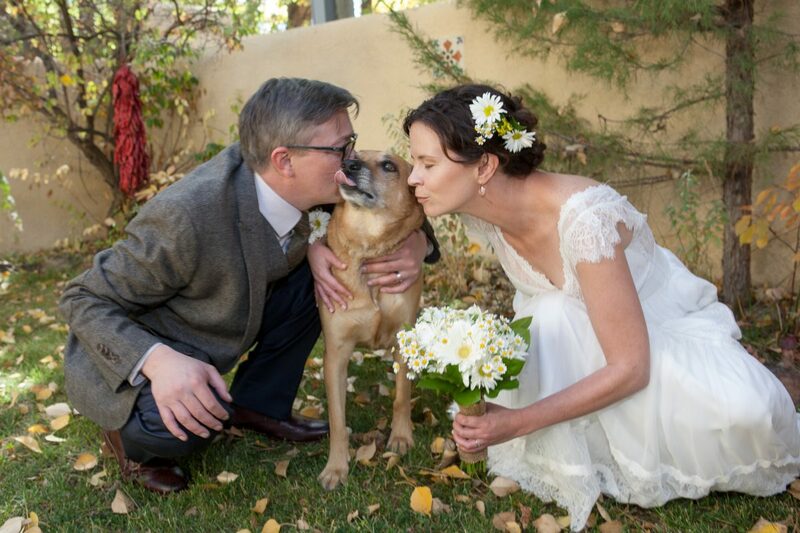 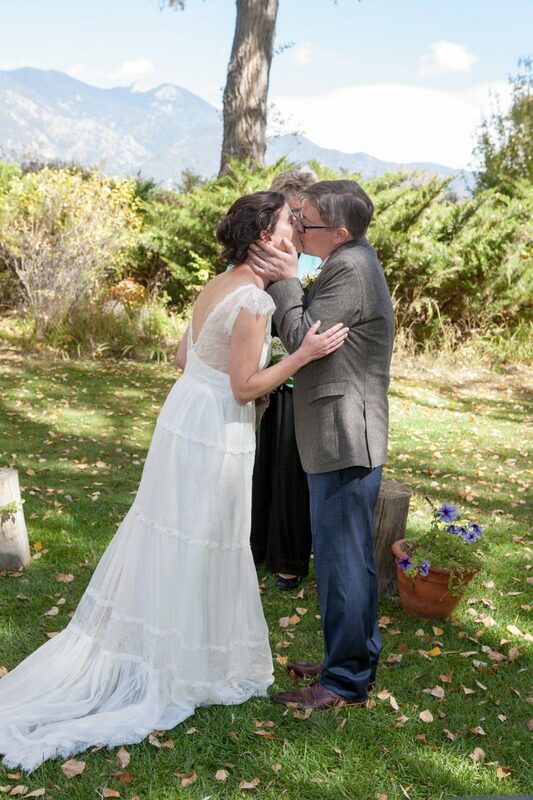 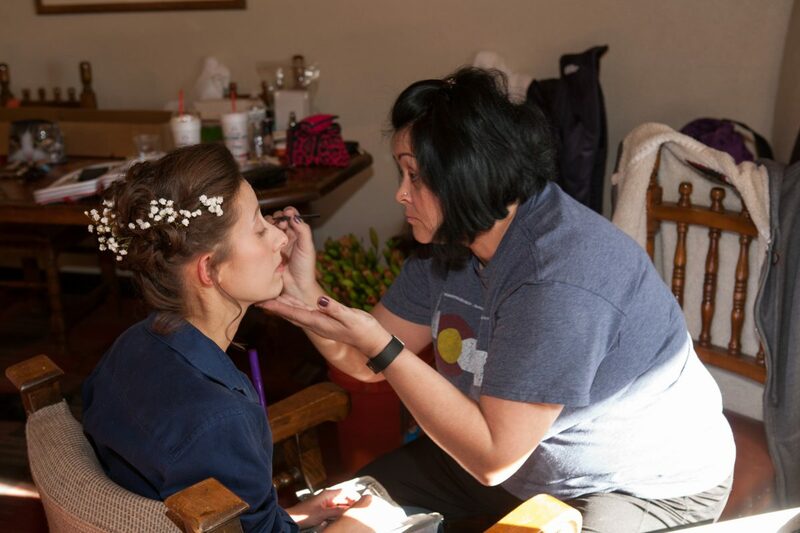 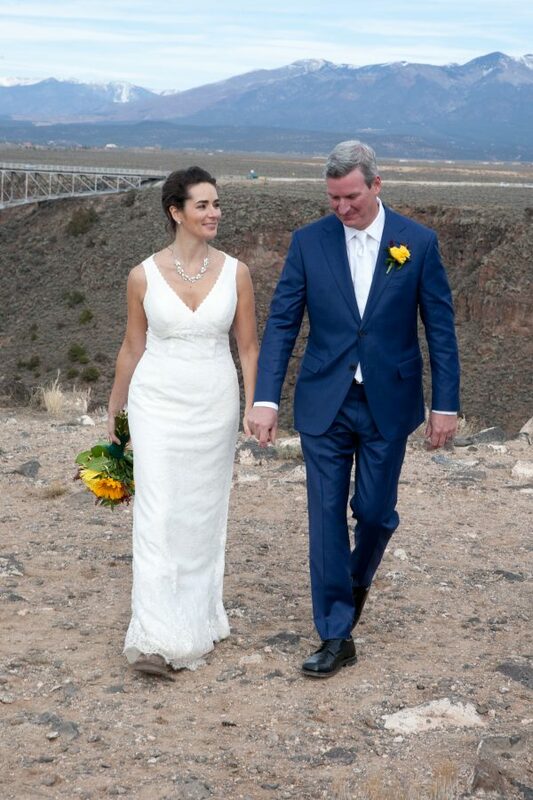 Another wonderful bride and groom from Colorado! 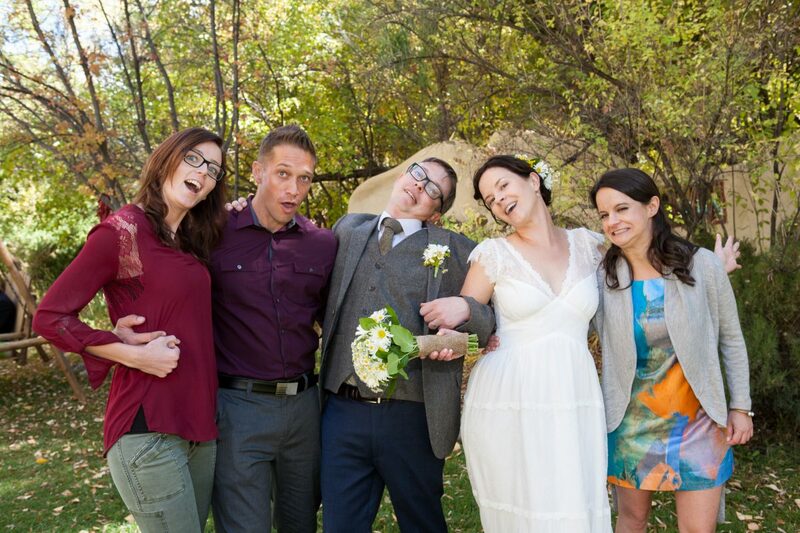 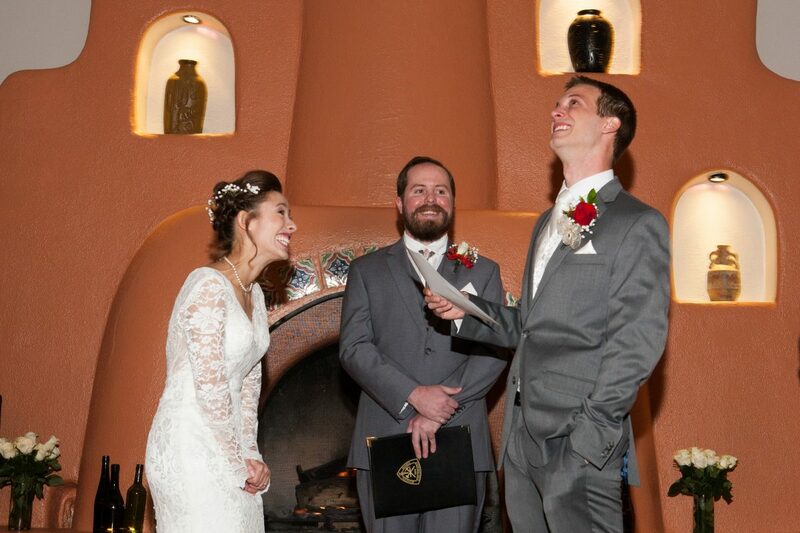 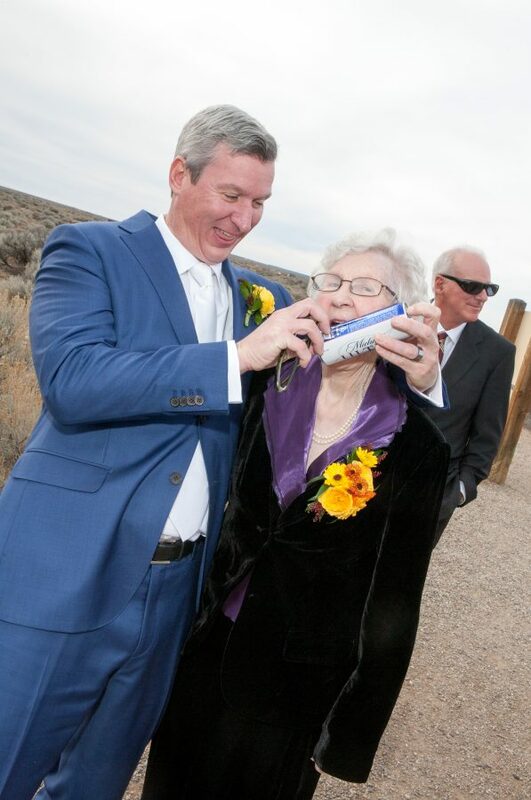 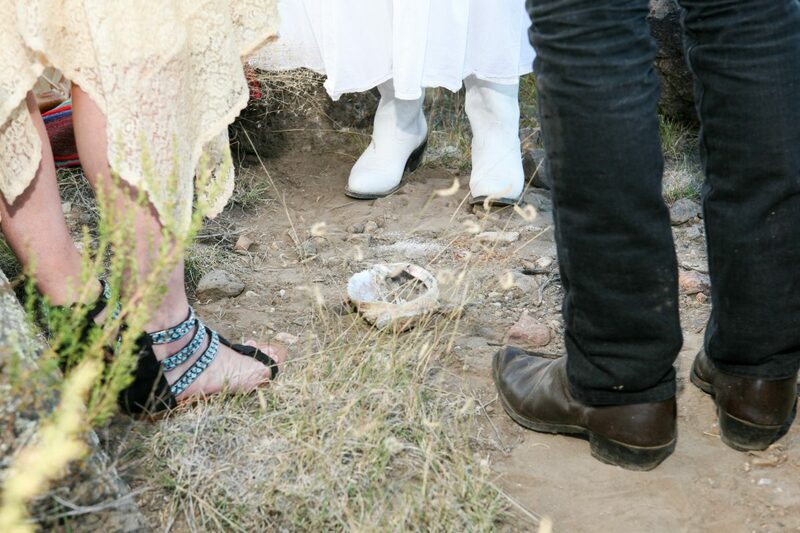 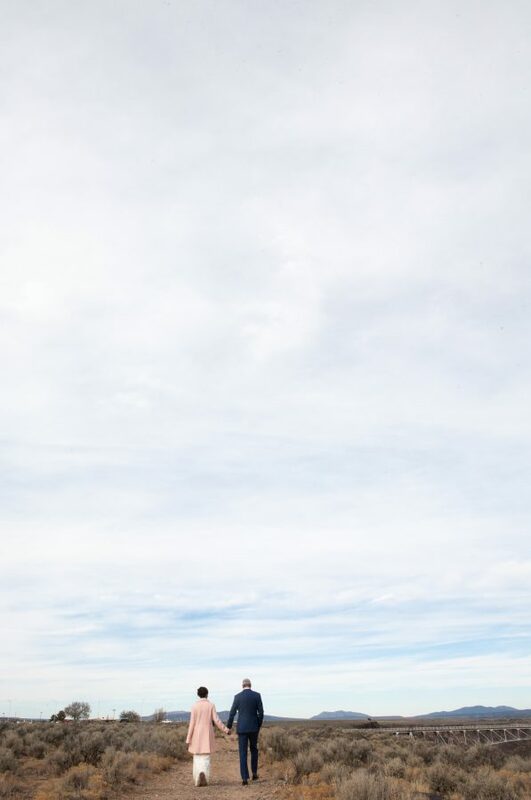 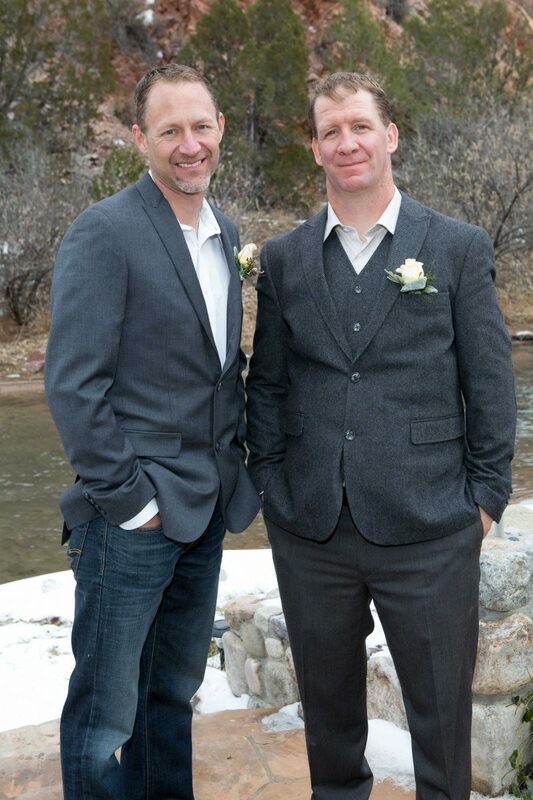 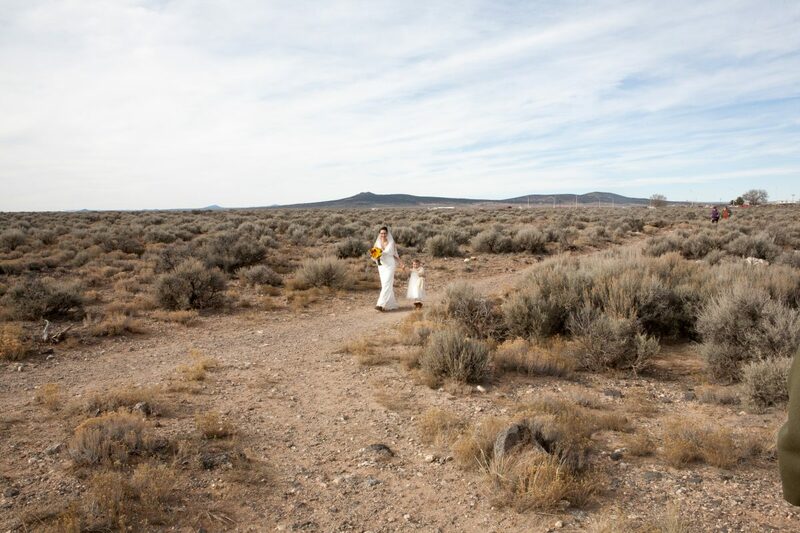 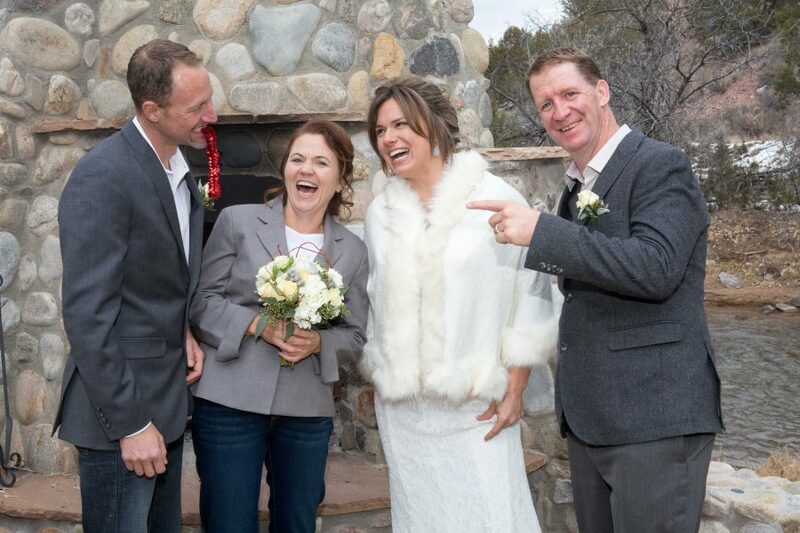 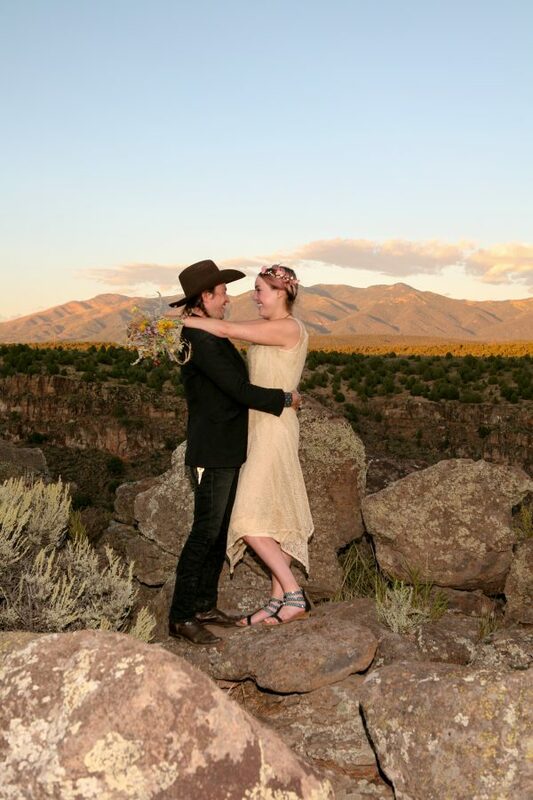 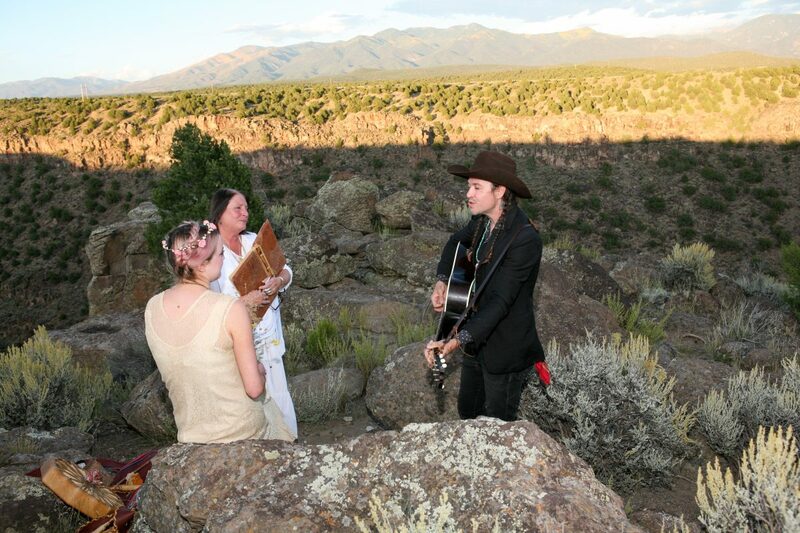 This fun couple had their wedding out on the mesa in Taos, NM. 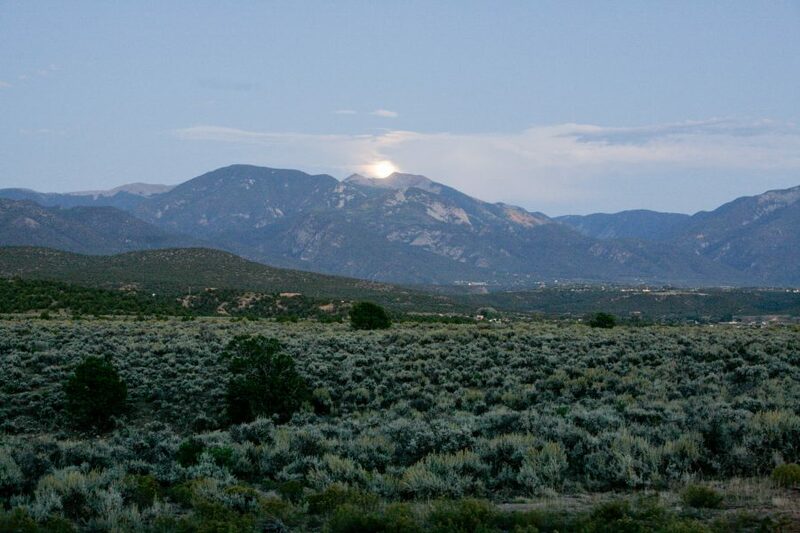 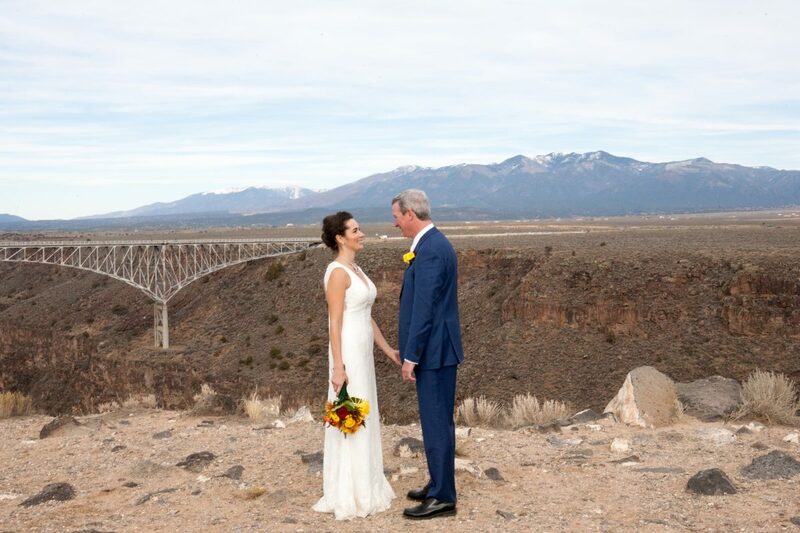 with the Sange de Cristo mountain range and Rio Grande Gorge Bridge adorning the background. 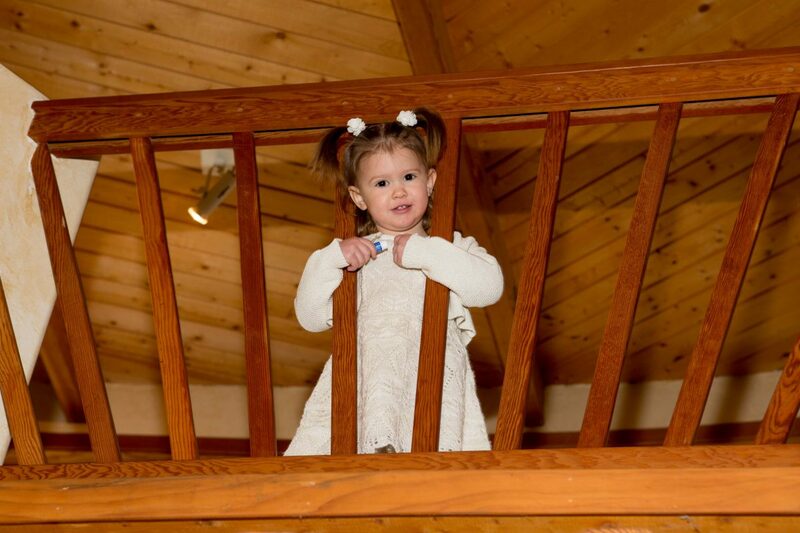 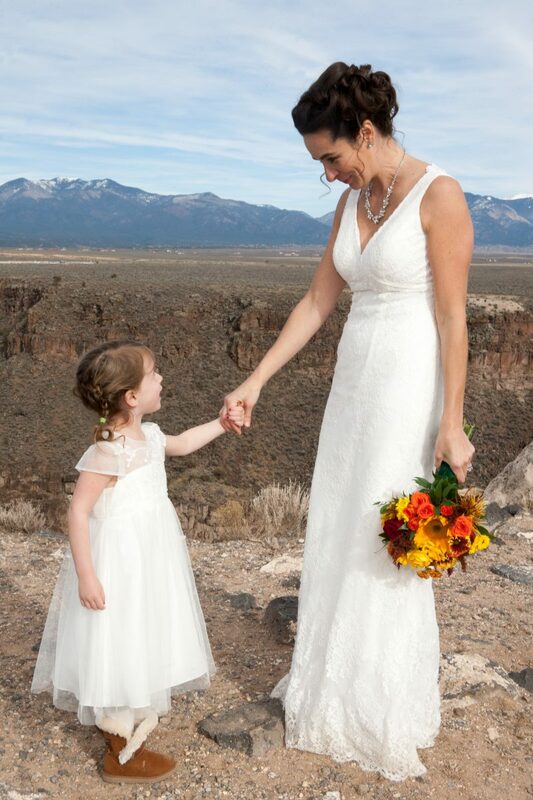 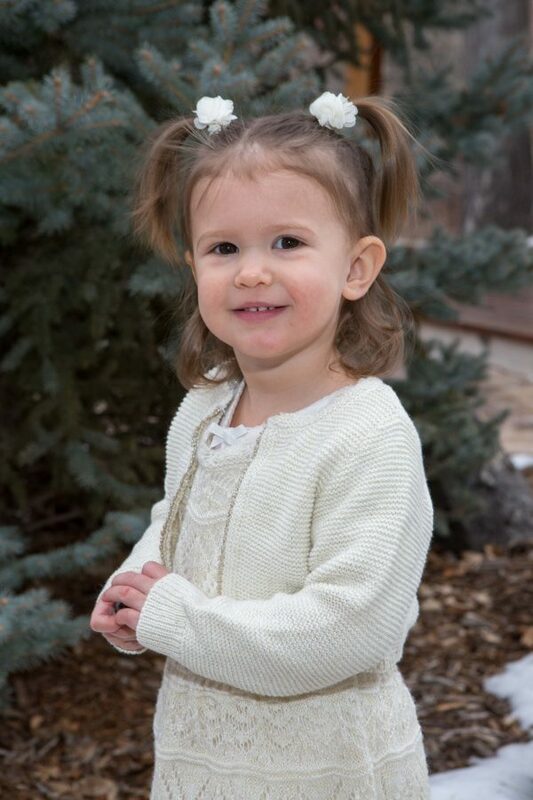 The bride and flower girl walked through the sagebrush to meet the groom out on the rim of the gorge who waited with about 25 guests. 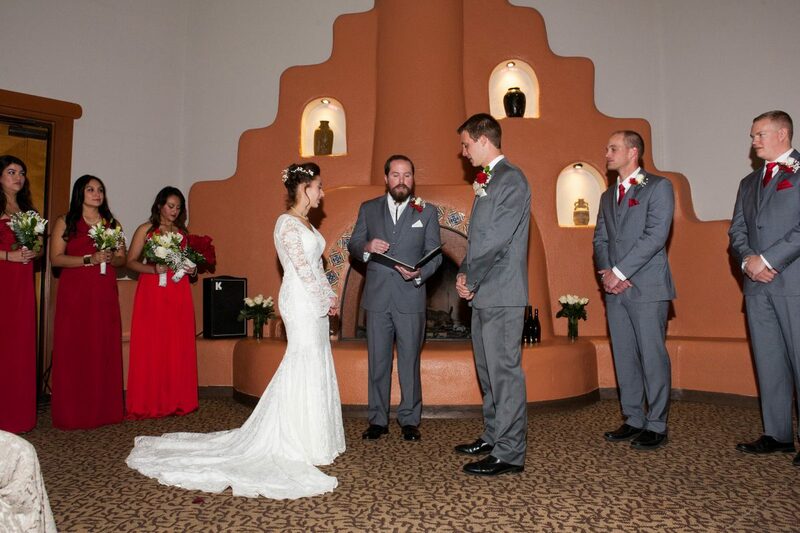 The ceremony was simple and sweet and was followed by a first dance. 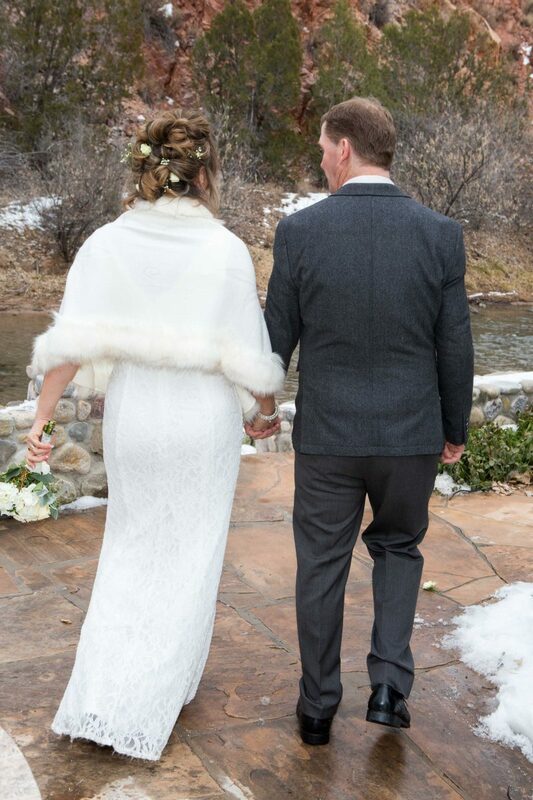 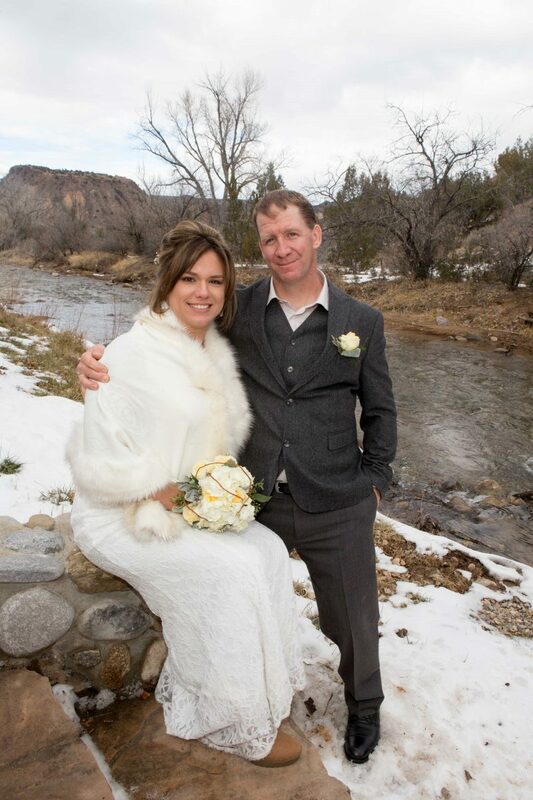 We had perfect weather and the next day it snowed over a foot, wedding luck! Congratulations to Sarah and Paris! 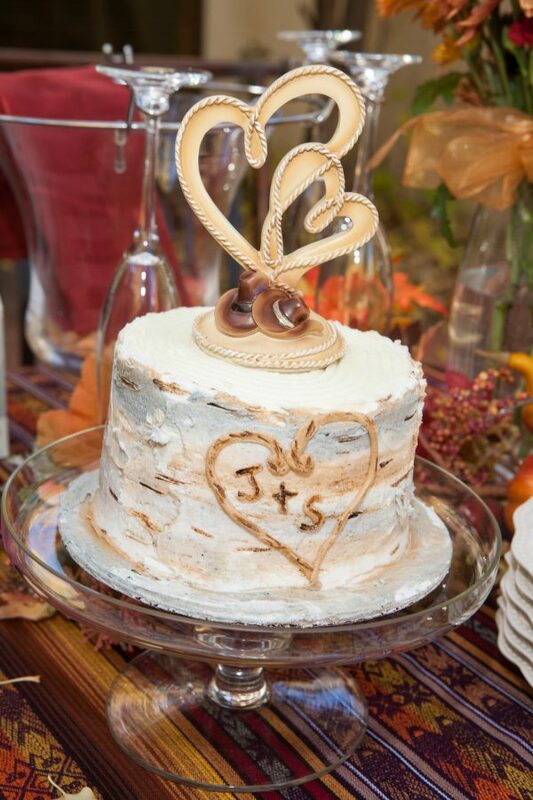 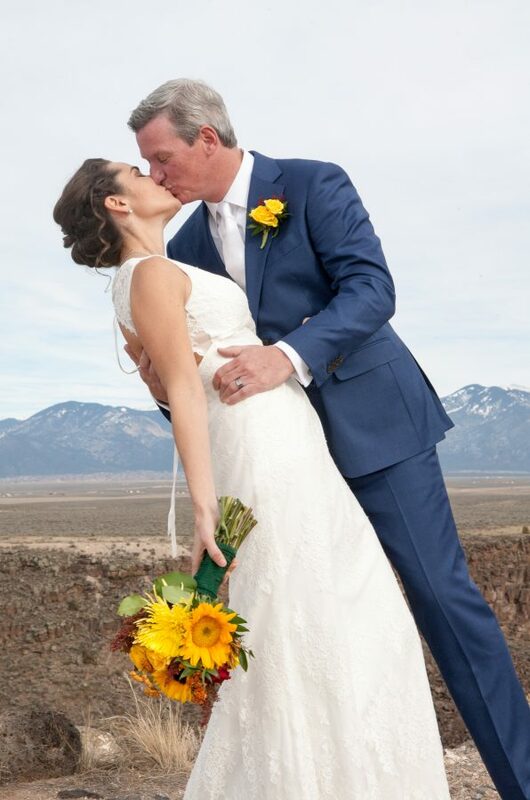 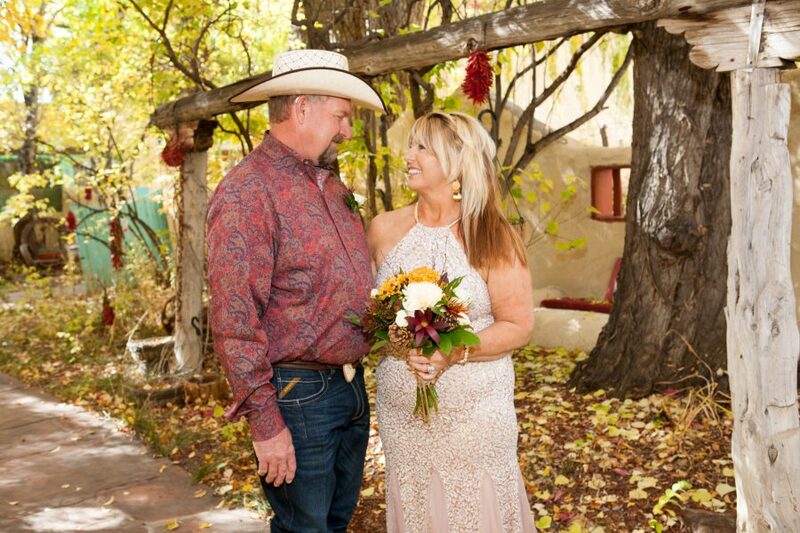 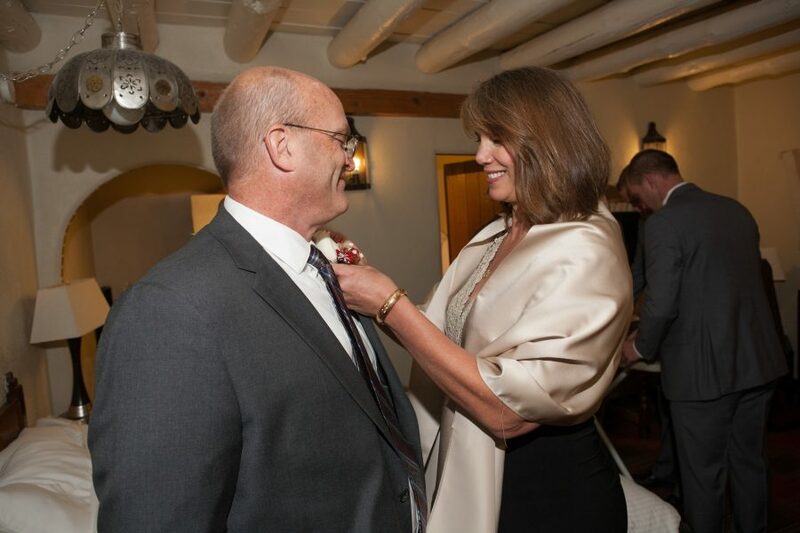 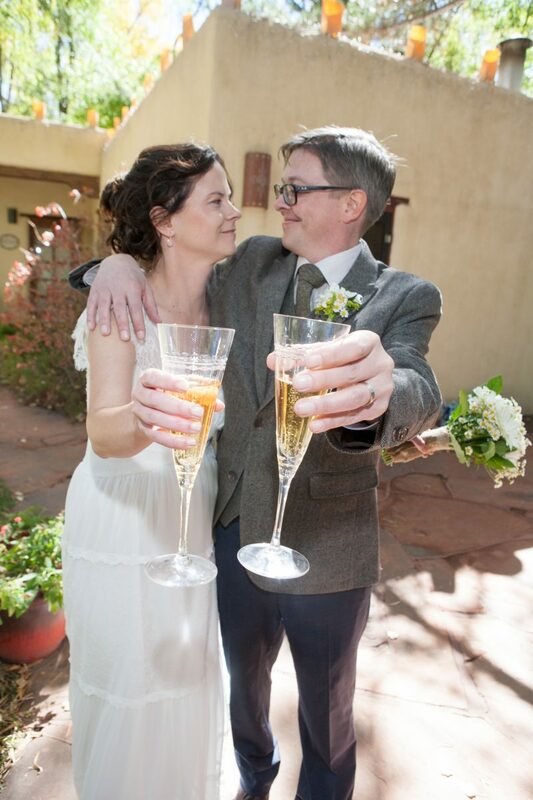 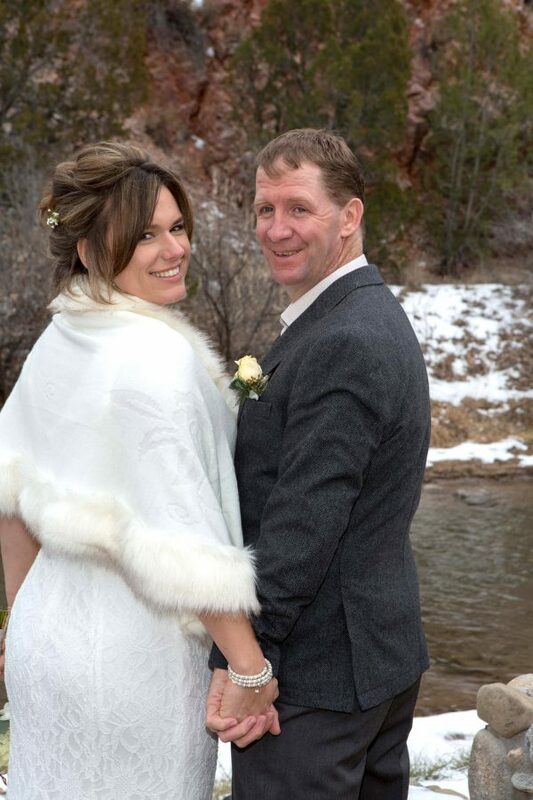 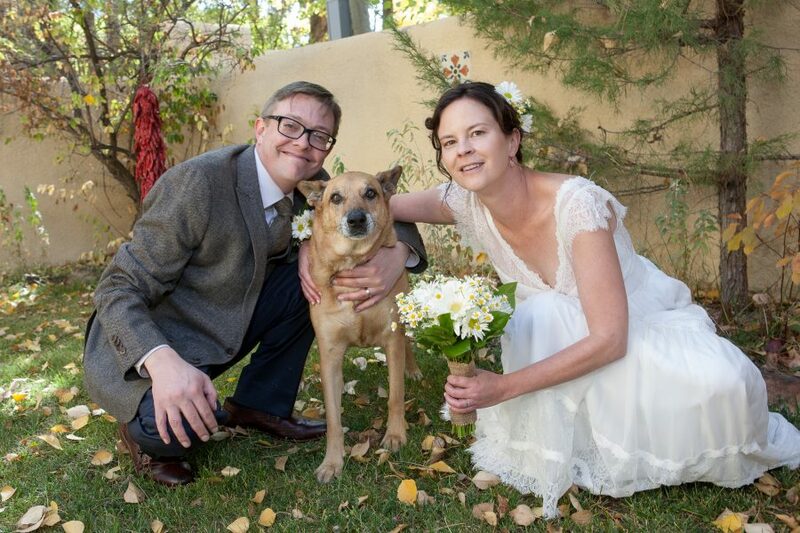 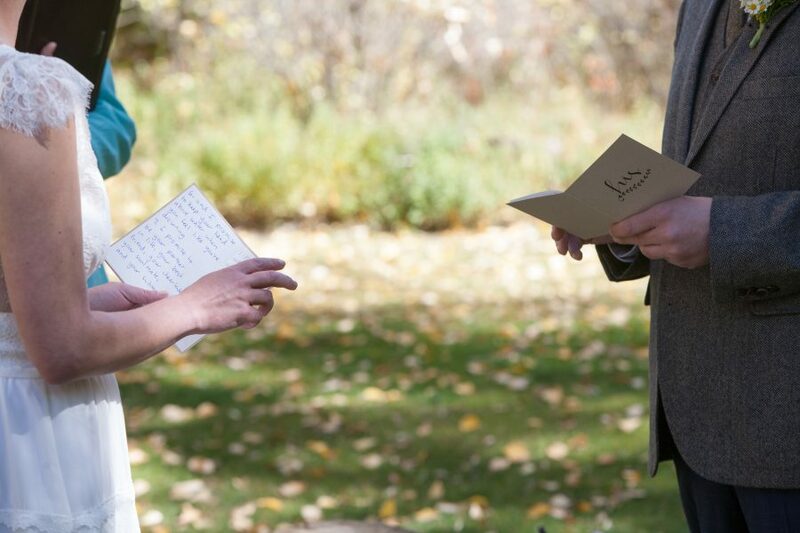 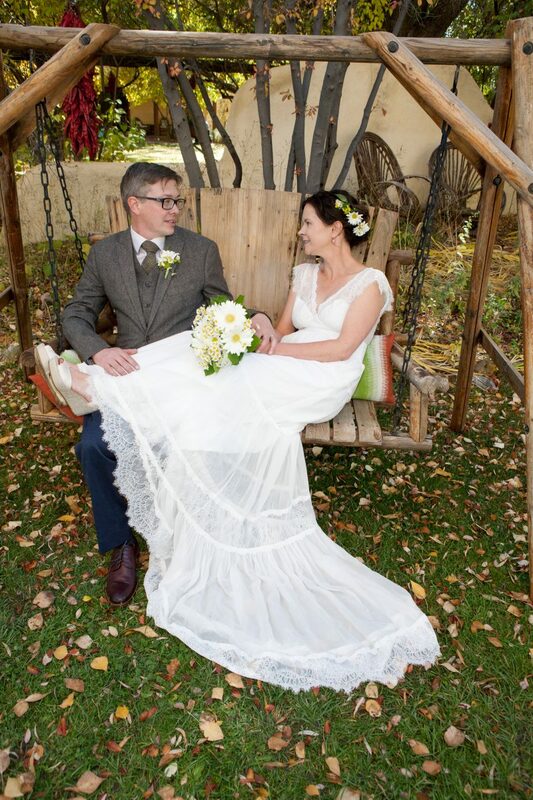 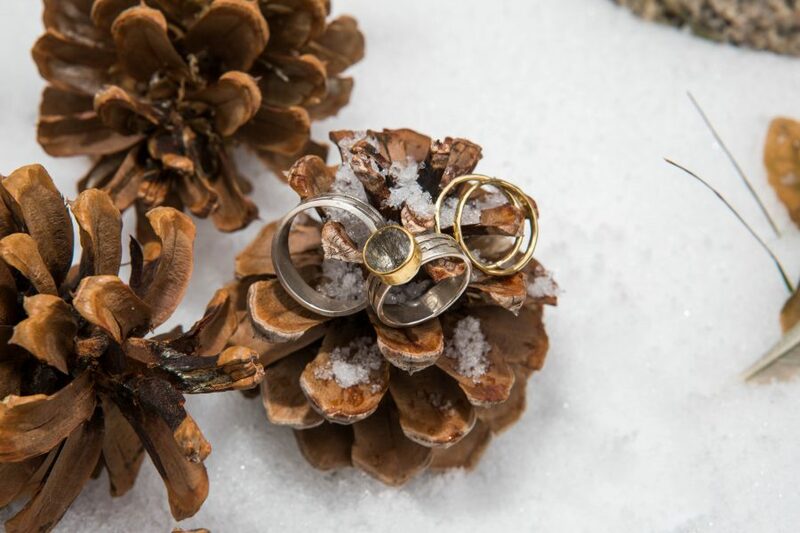 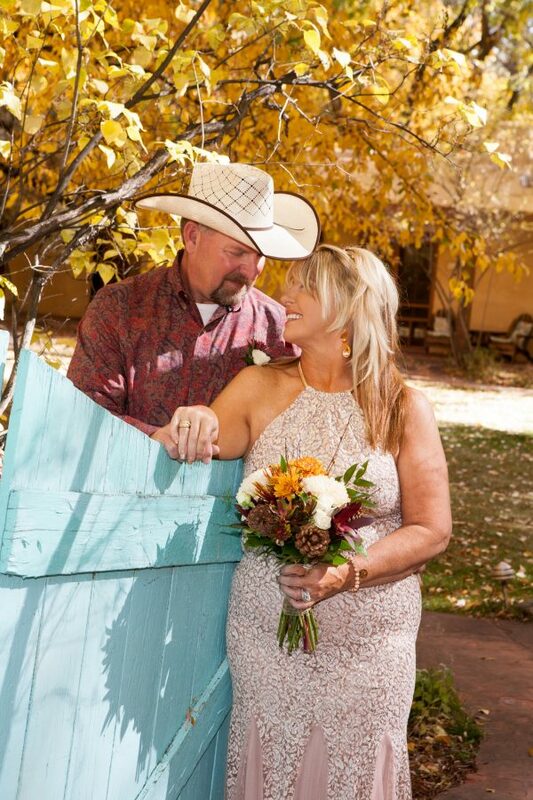 Shawna and Jay planned months ahead and guessed when the time to get married under the wonder of the golden leaves in the autumn in Taos would be…and they nailed the date!! 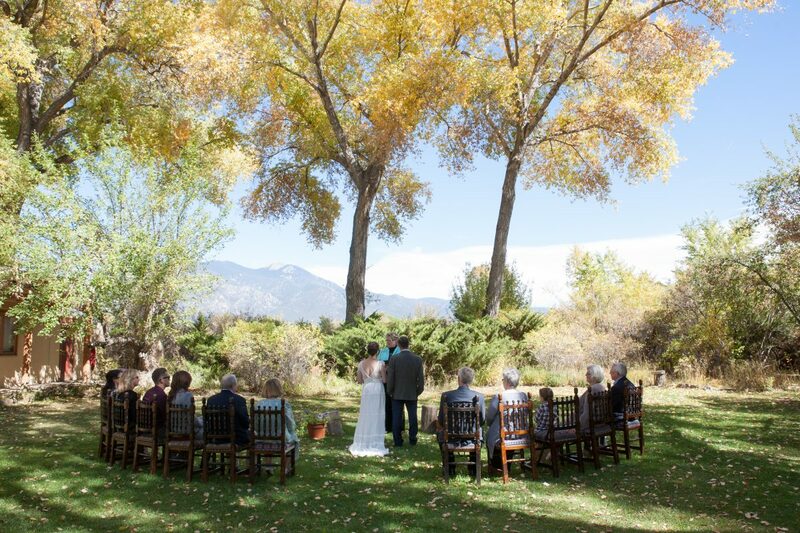 This year the *perfect* fall foliage date was the weekend of October 15th. 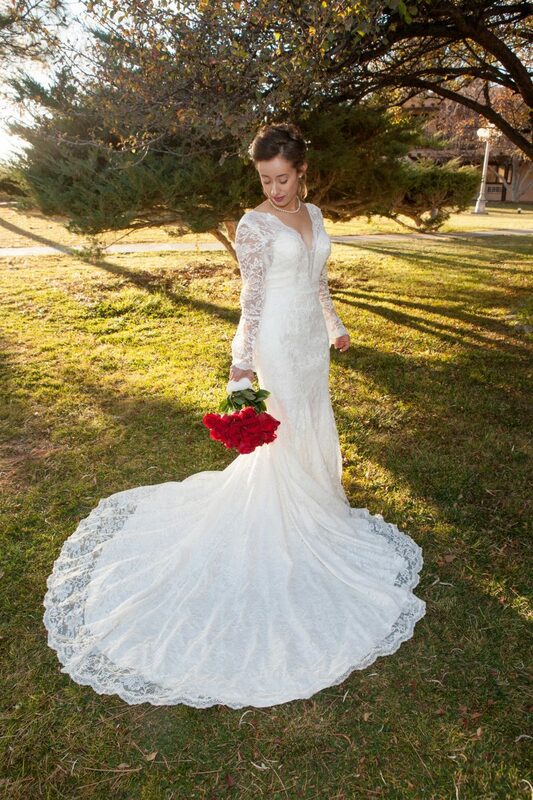 The sun was shining and warm, there was a perfect light breeze. 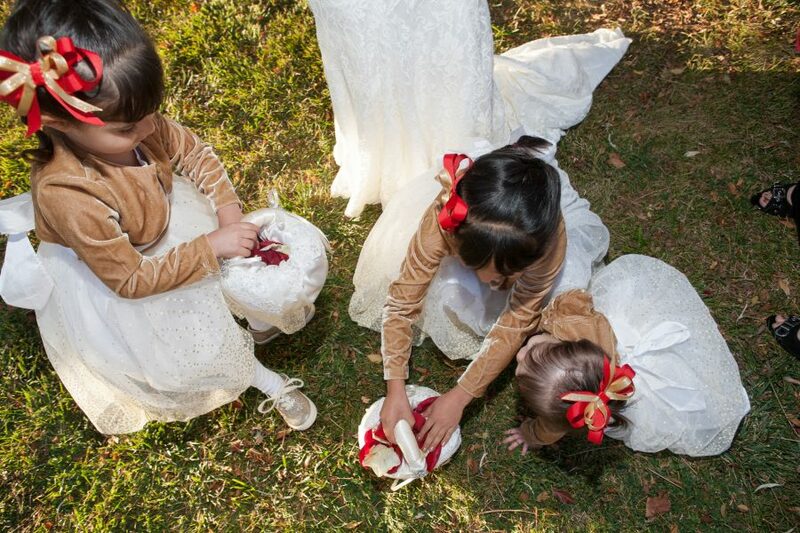 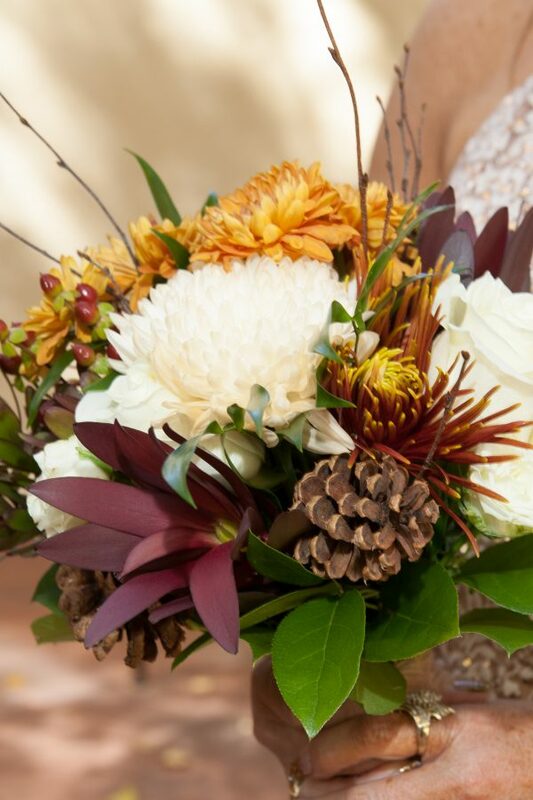 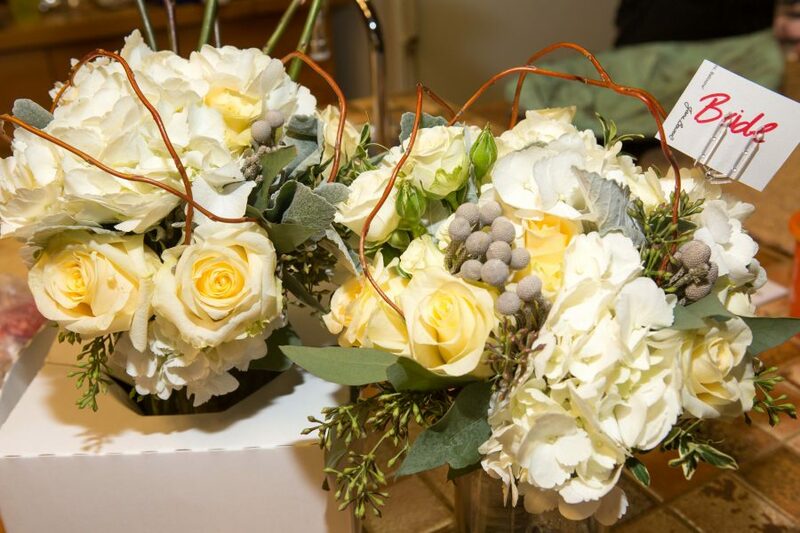 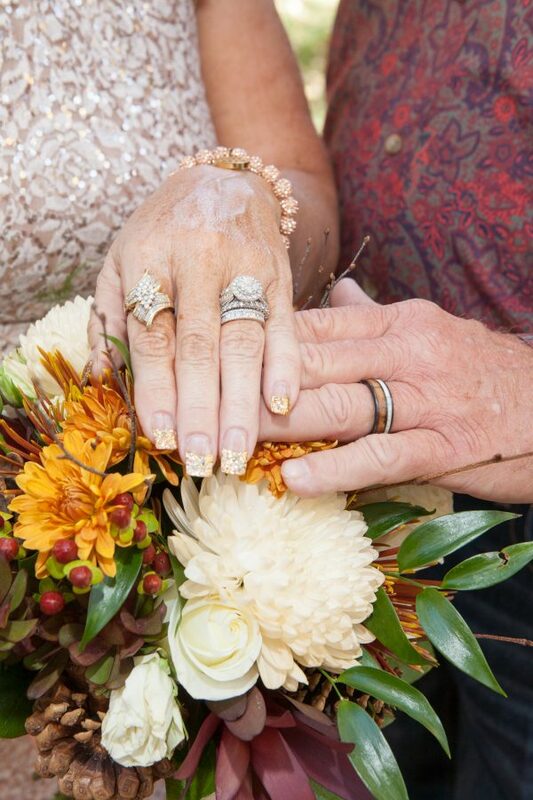 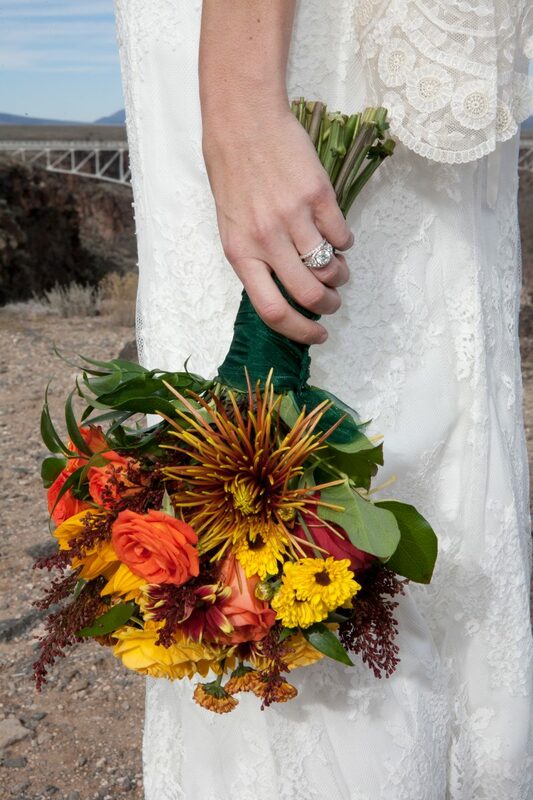 The bride had a autumn colored bouquet that was even adorned with some pine cones! 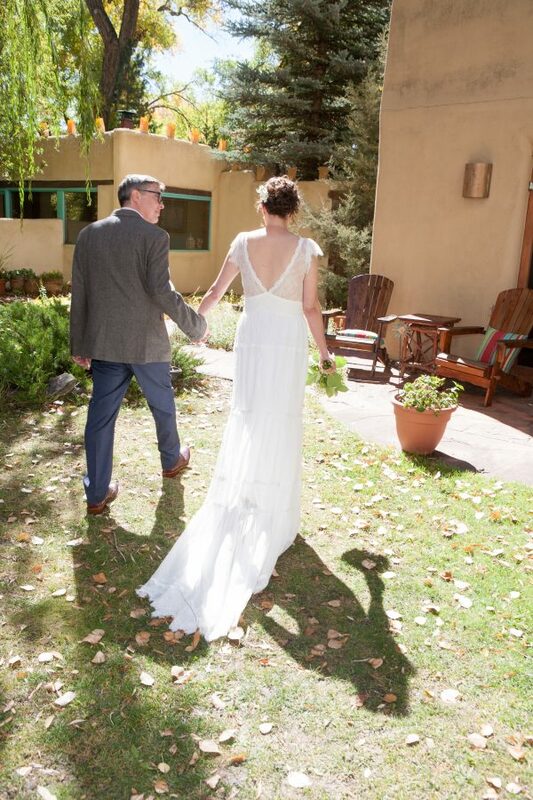 The light was perfect coming through the leaves, it was a good day to be a photographer. 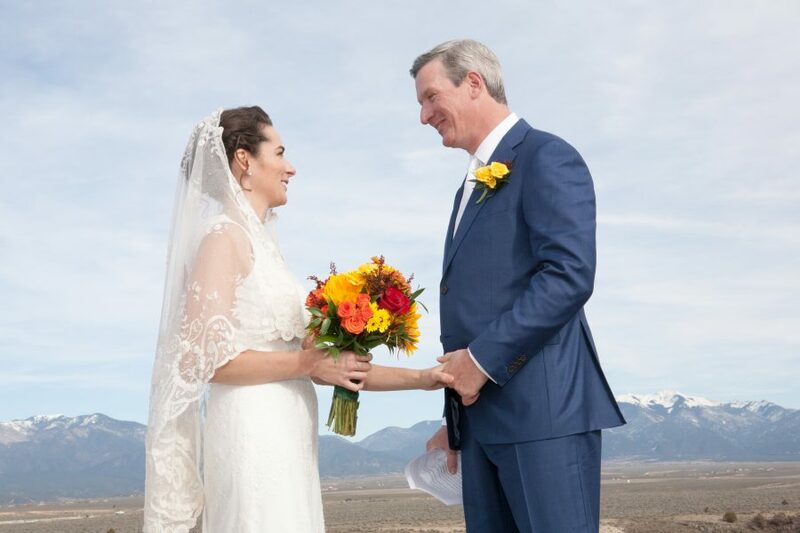 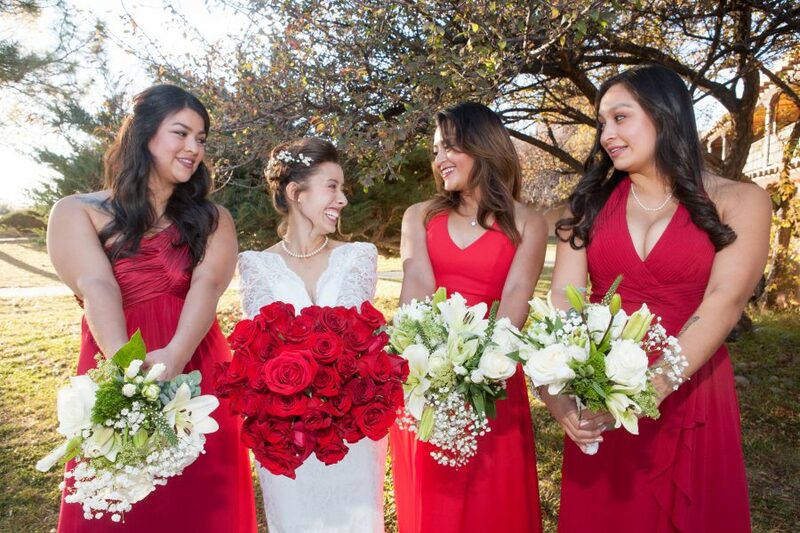 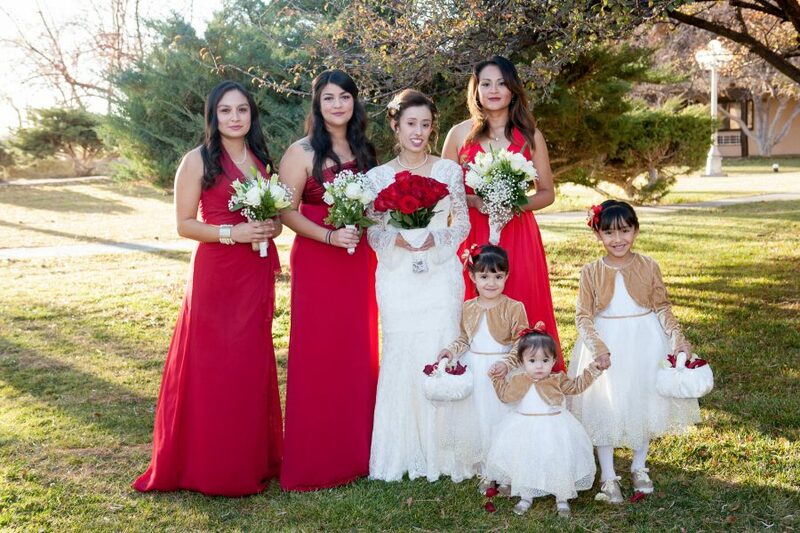 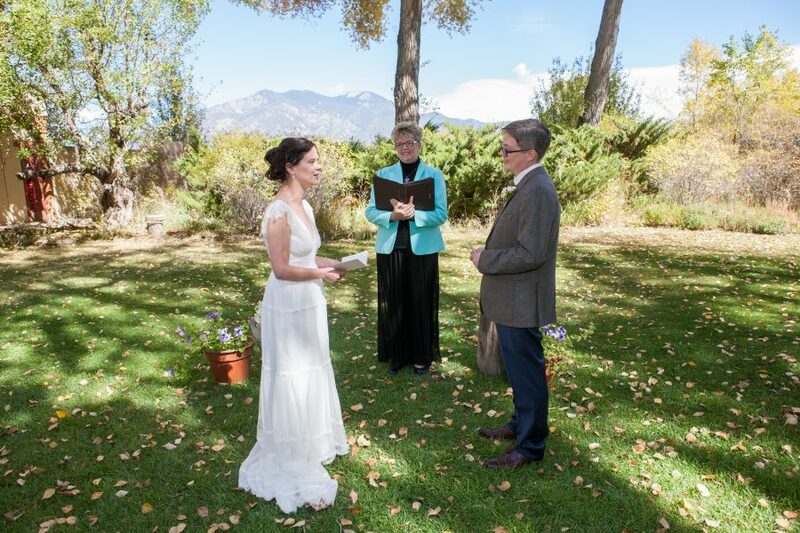 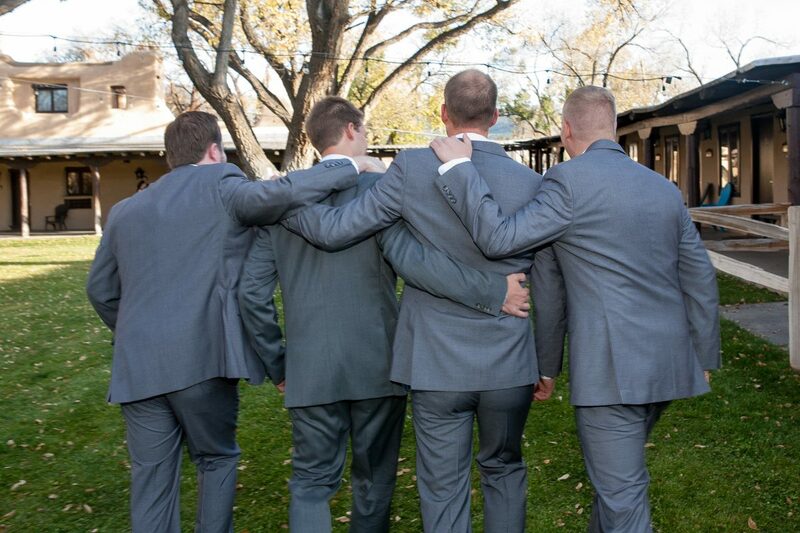 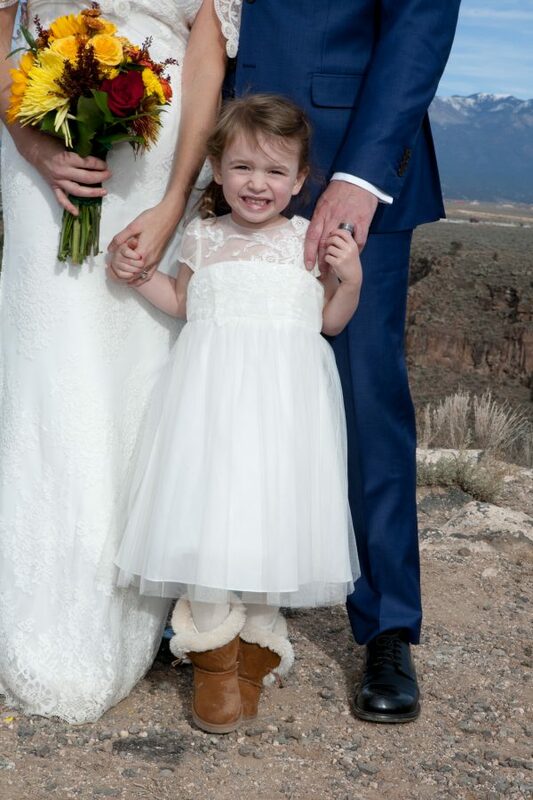 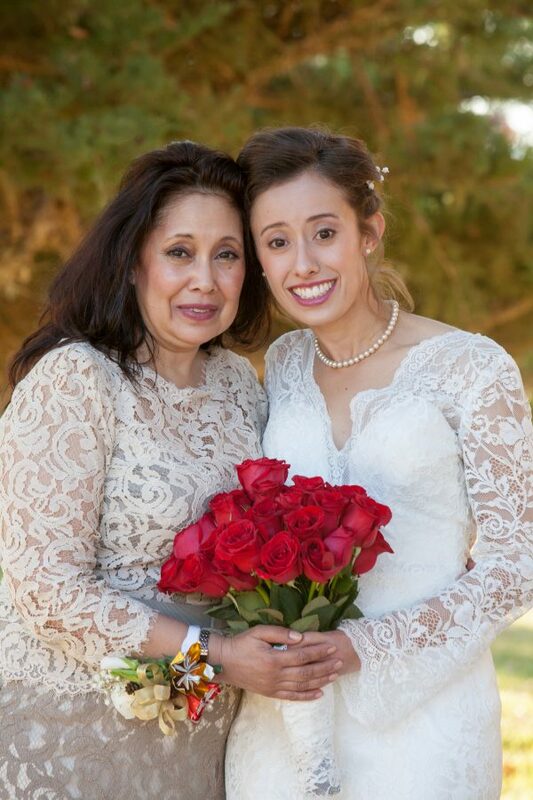 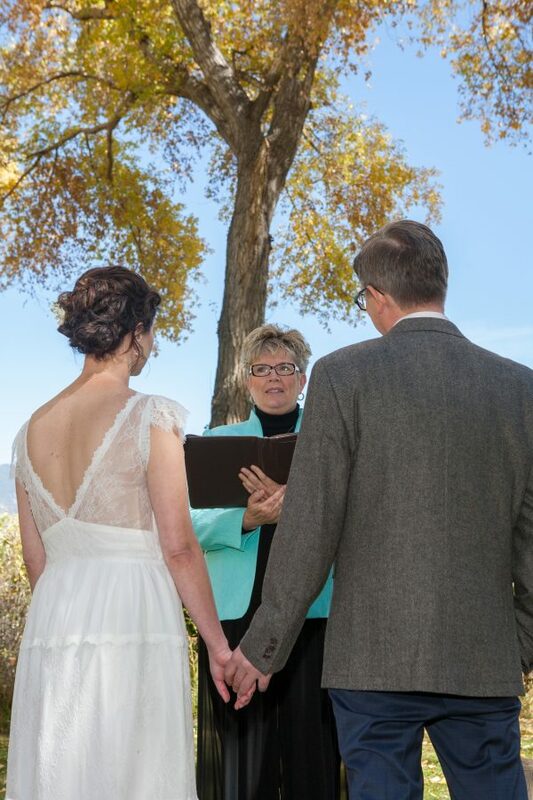 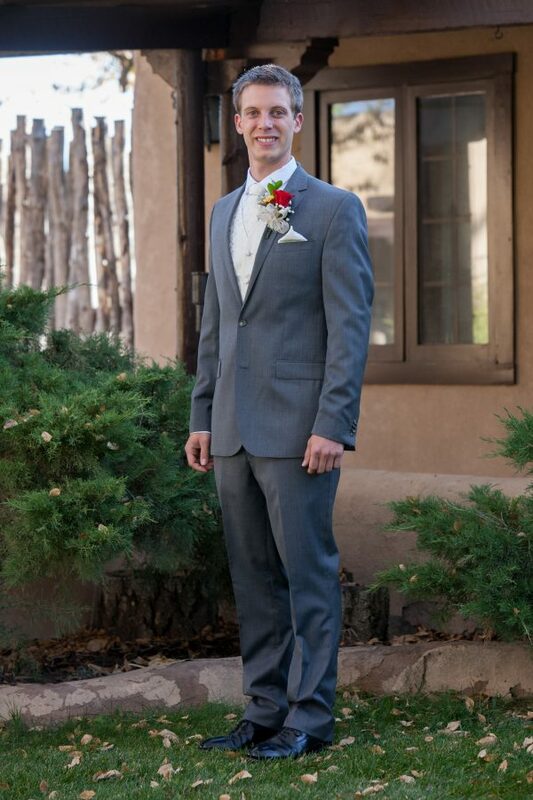 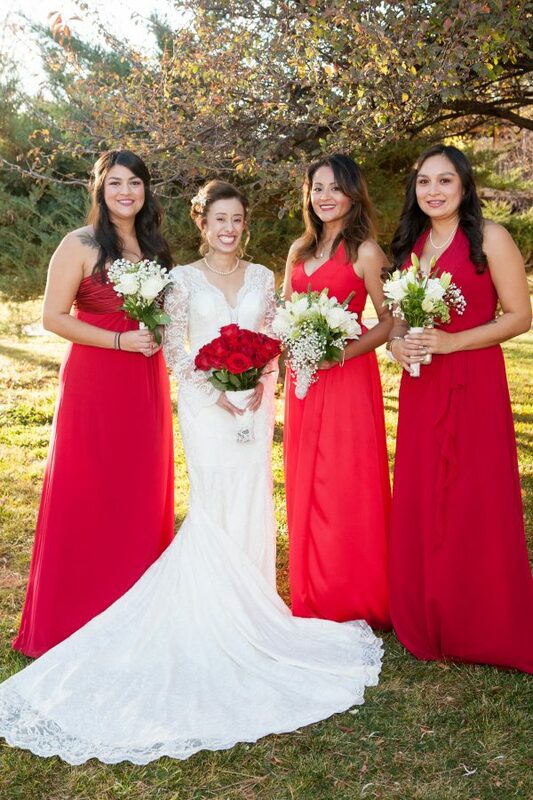 This bride and groom picked a beautiful, autumn day to travel from Denver, Colorado to Taos, New Mexico for a gorgeous, outdoor fall wedding. 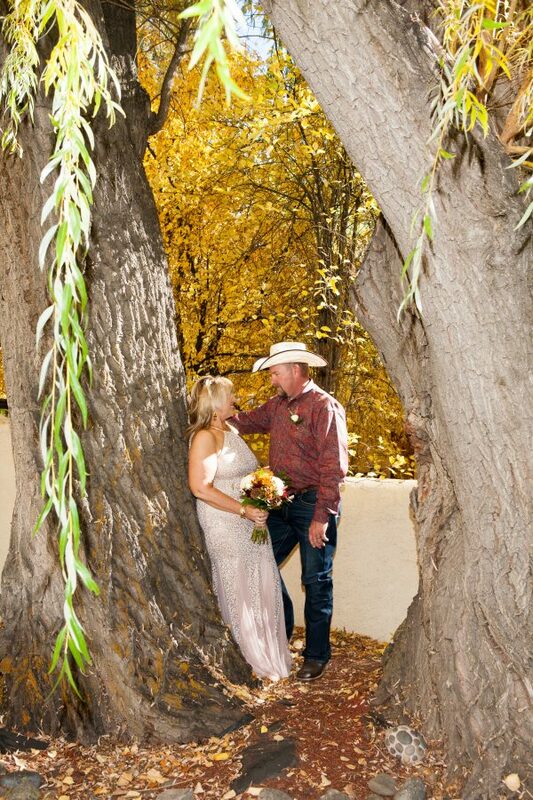 The leaves were floating off of the trees during the short wedding ceremony. 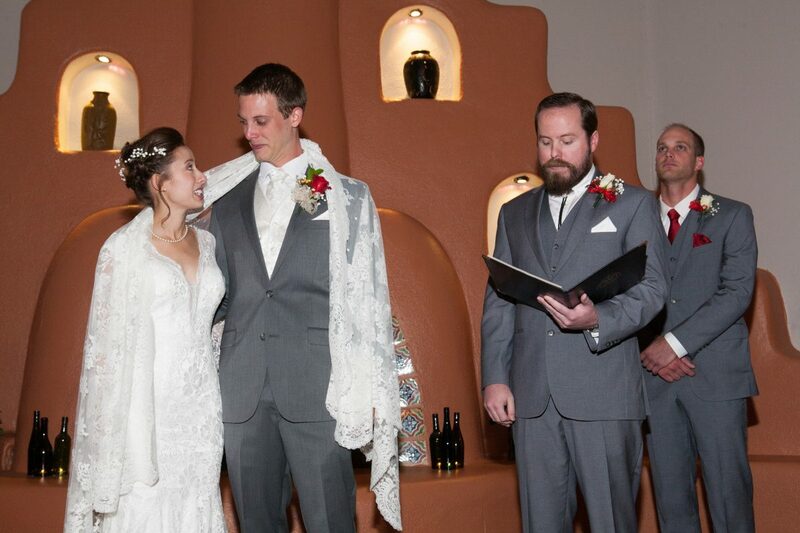 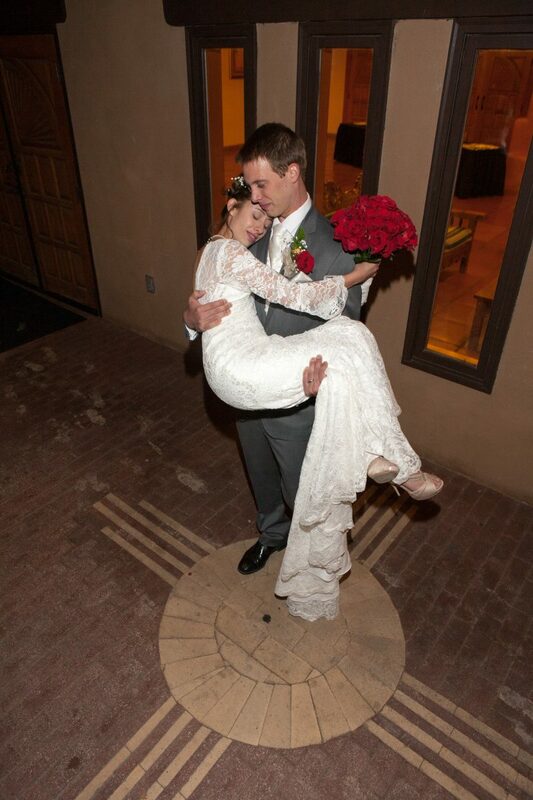 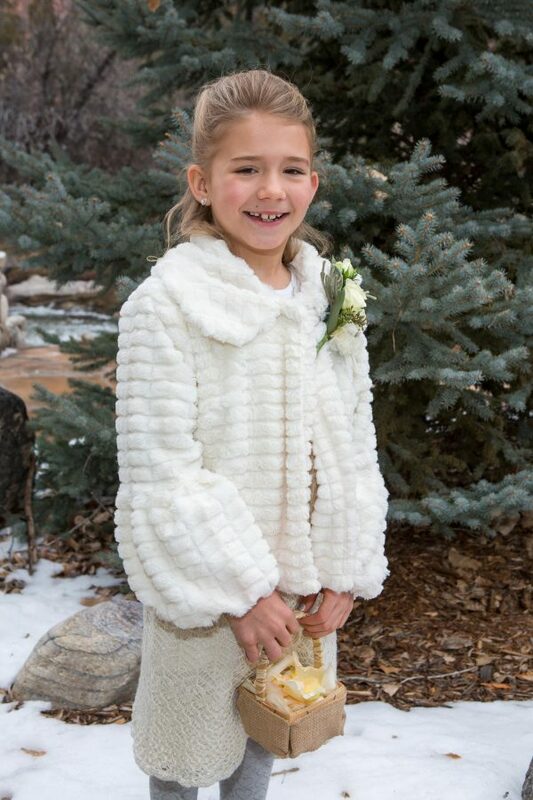 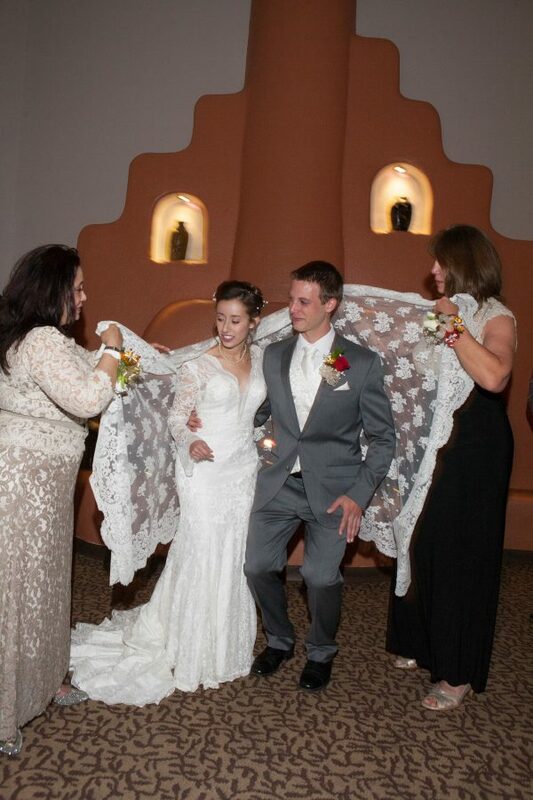 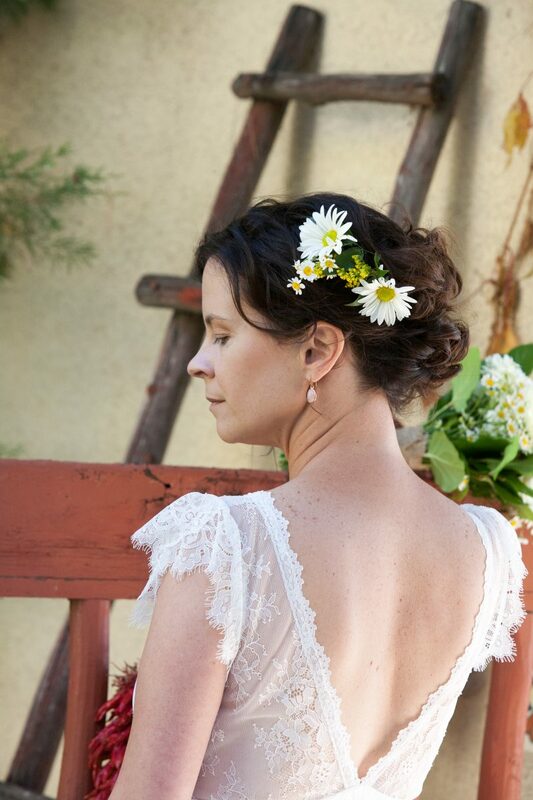 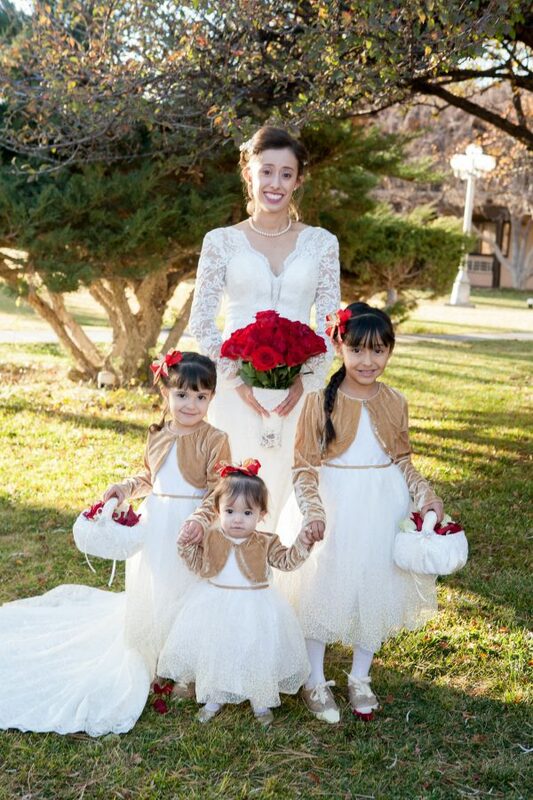 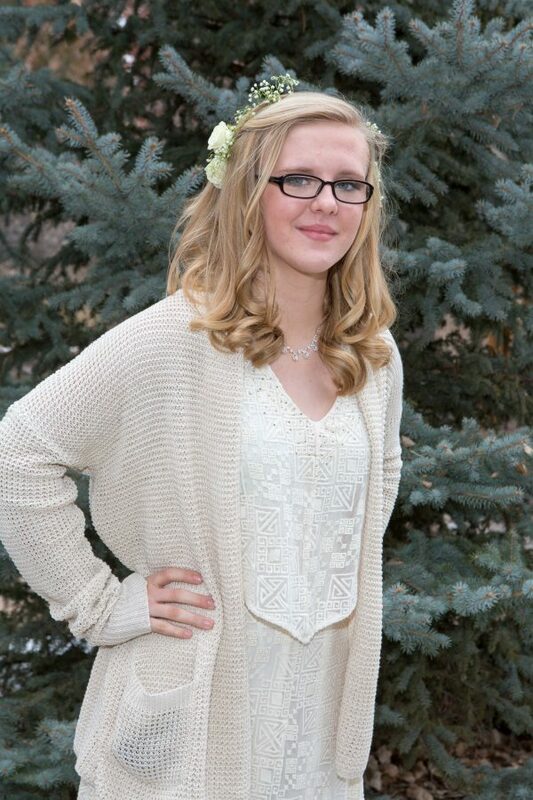 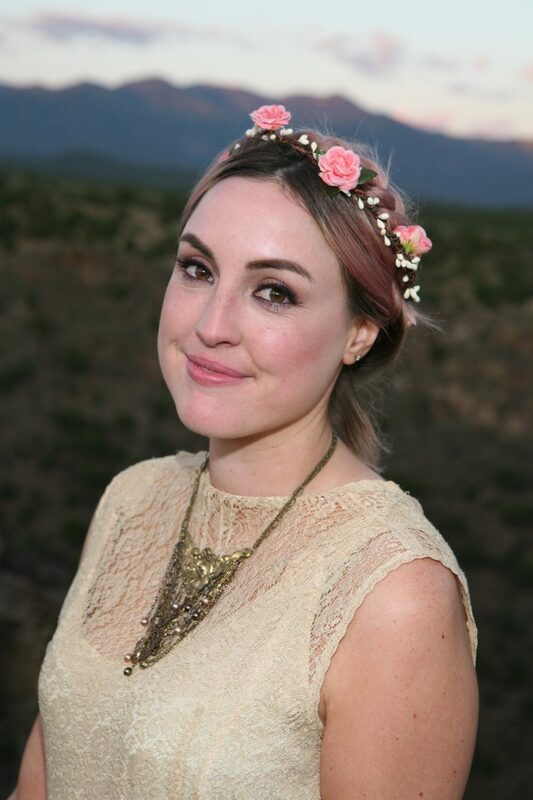 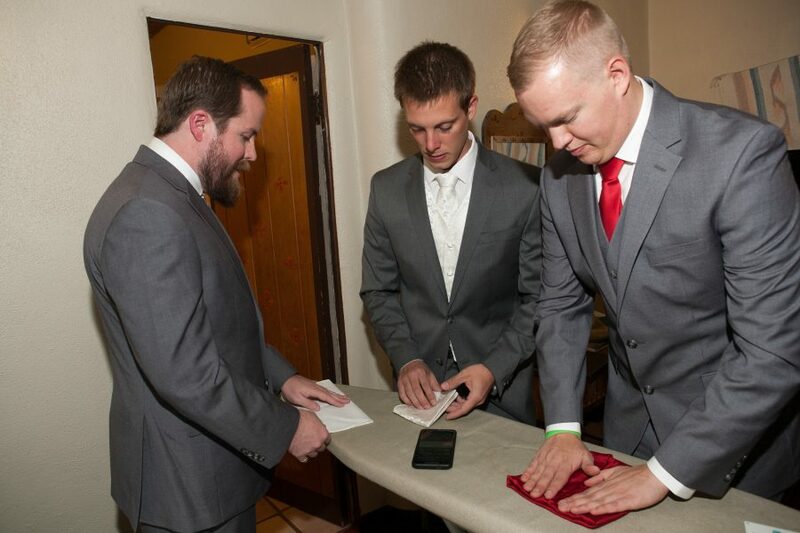 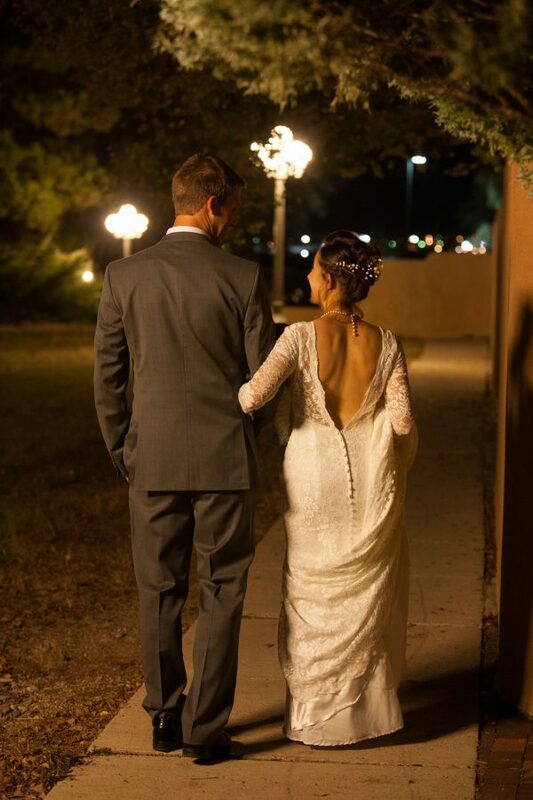 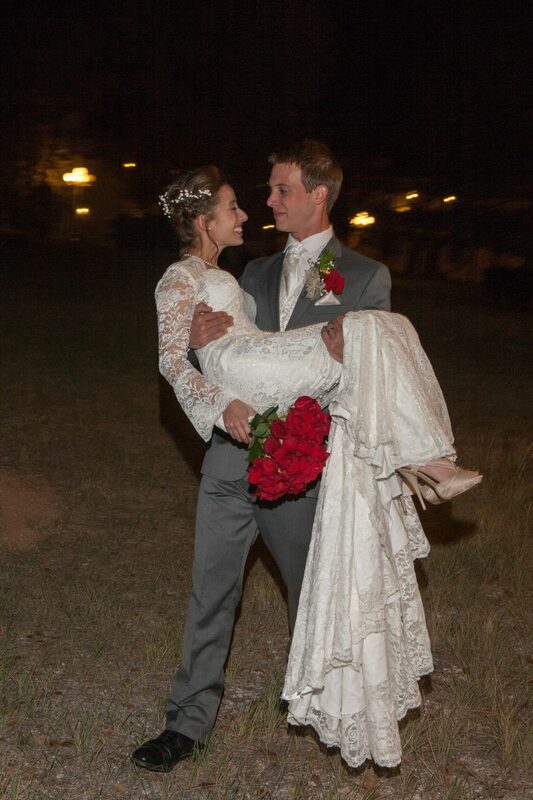 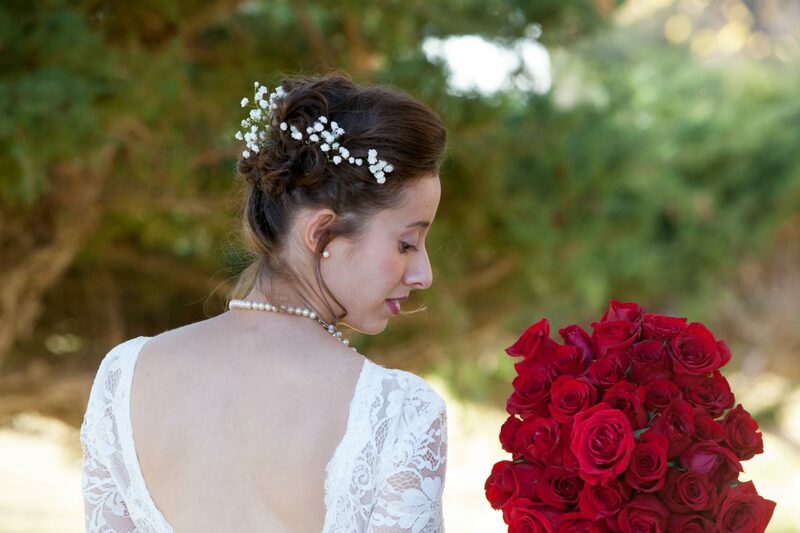 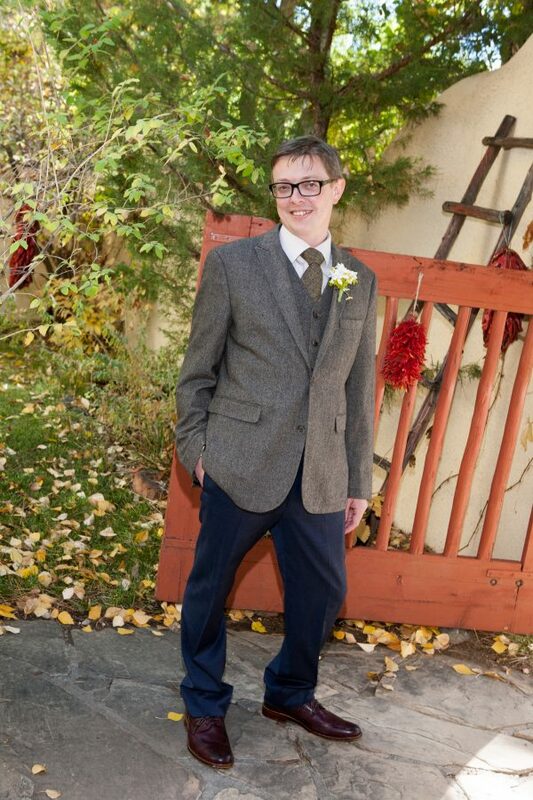 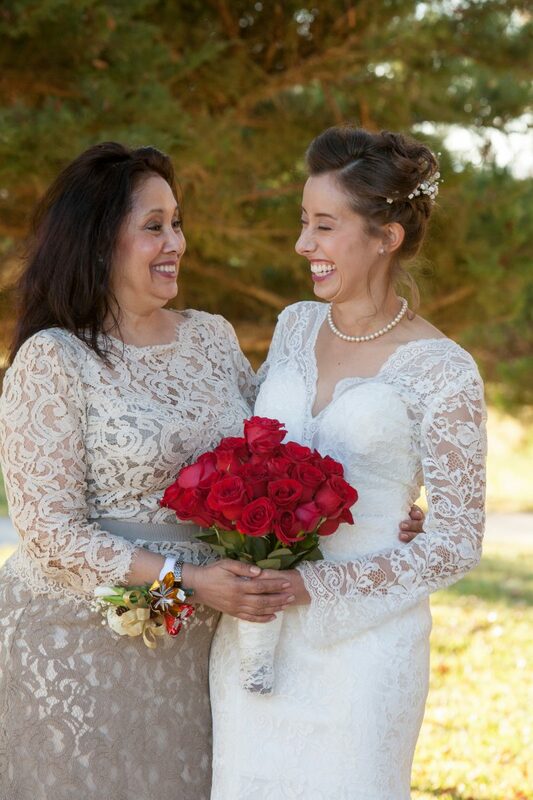 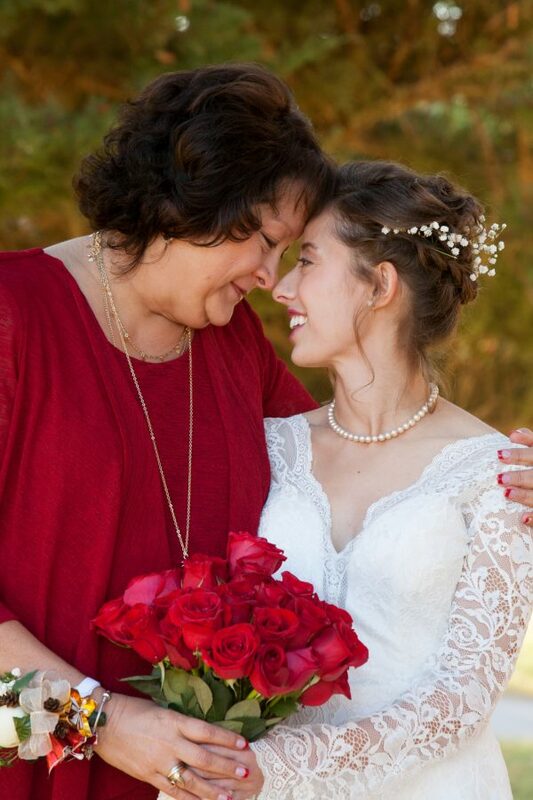 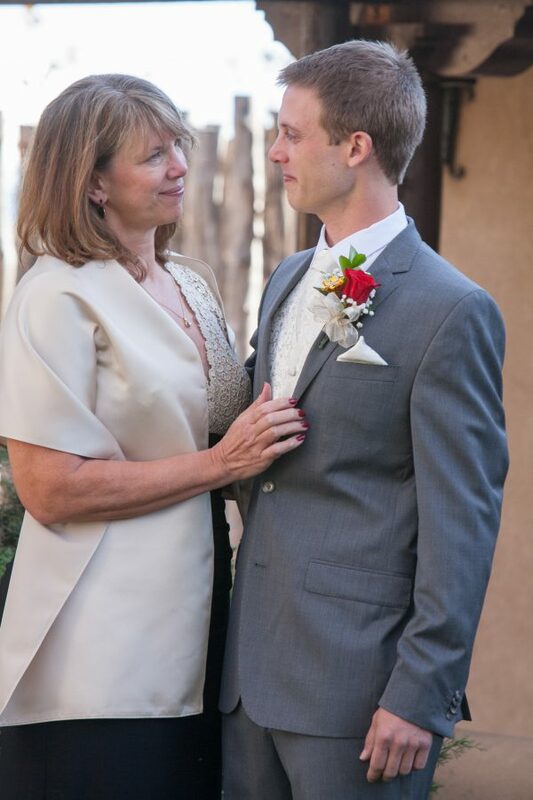 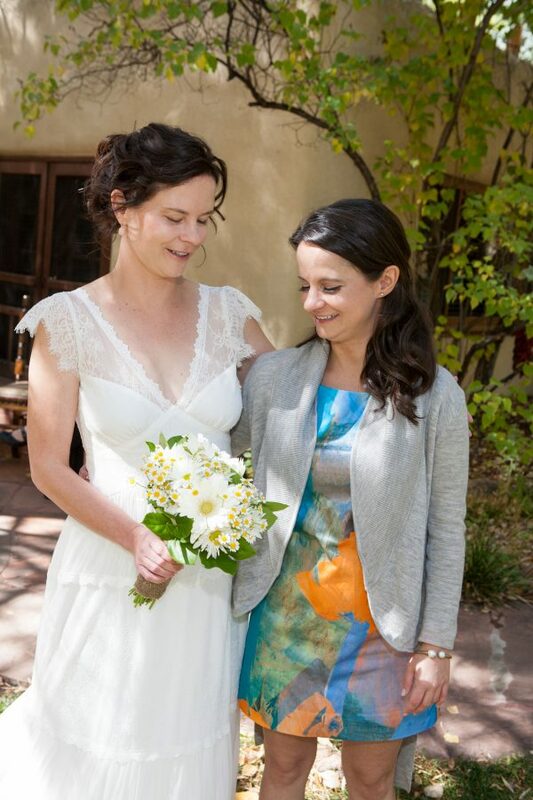 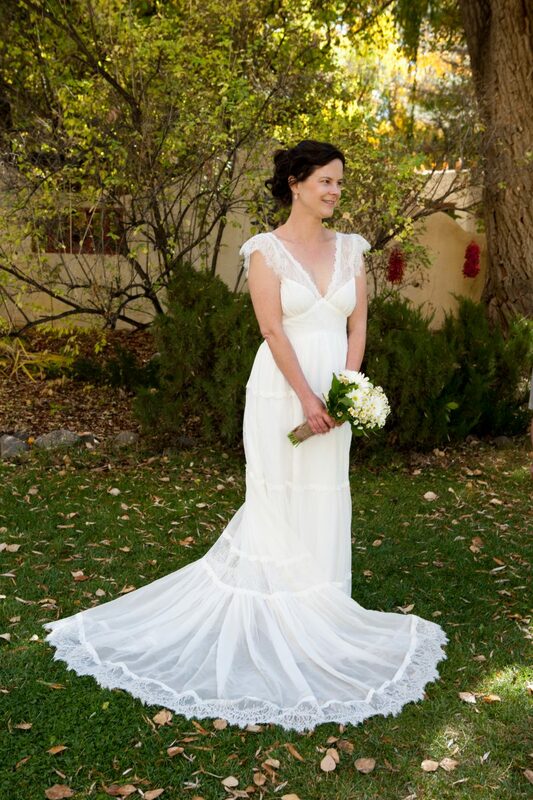 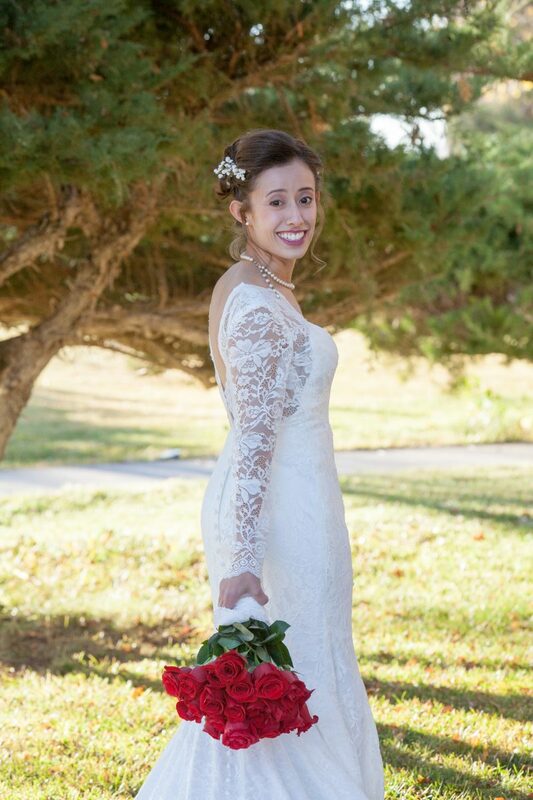 Devon wore a delicate, vintage wedding dress. 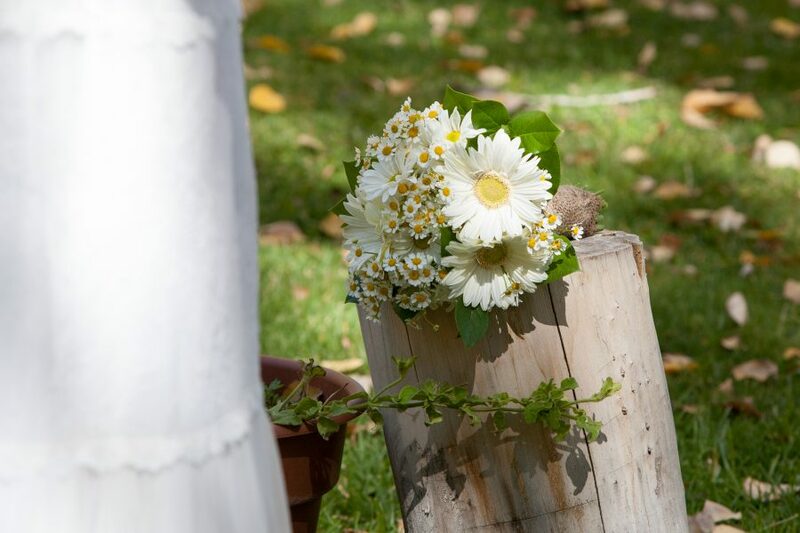 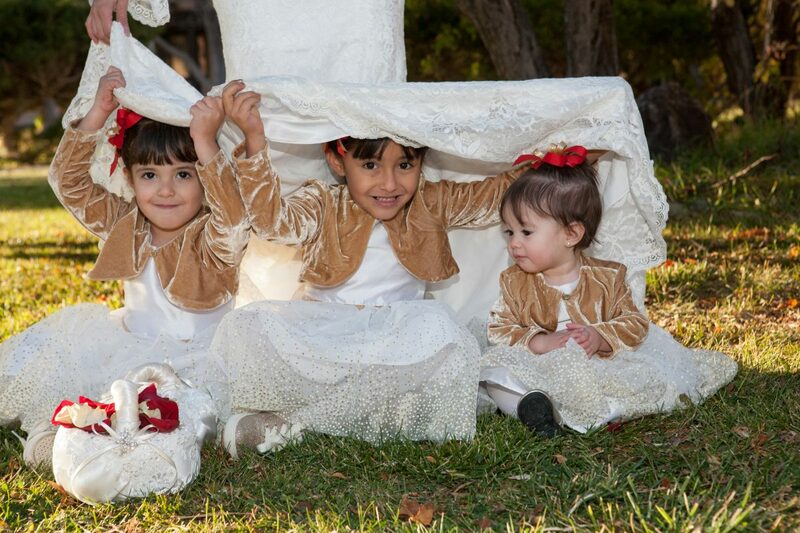 Her chamomile and daisy bouquet was simply wrapped in burlap. 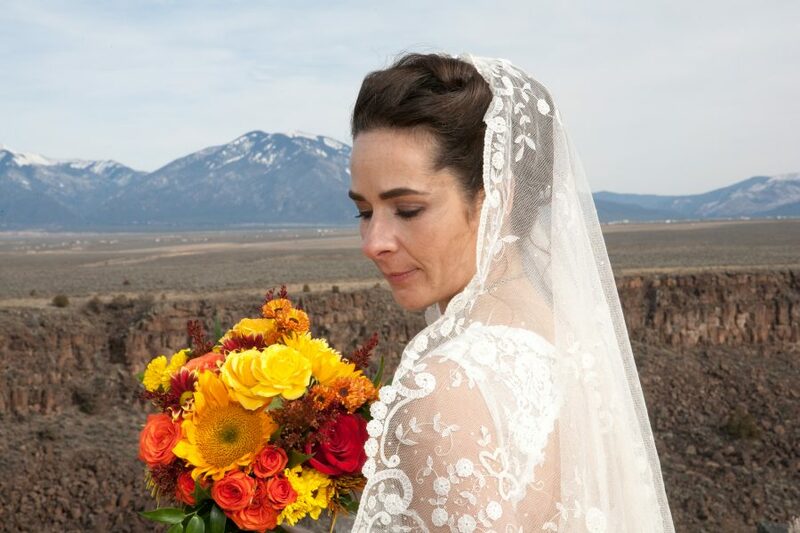 The red chiles were a beautiful contrast with the fall foliage, a reminder of the harvest that also takes place in the autumn. 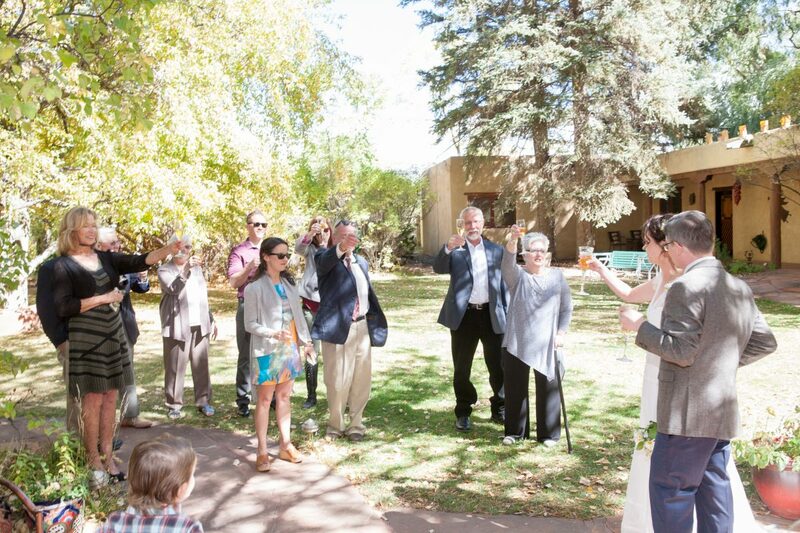 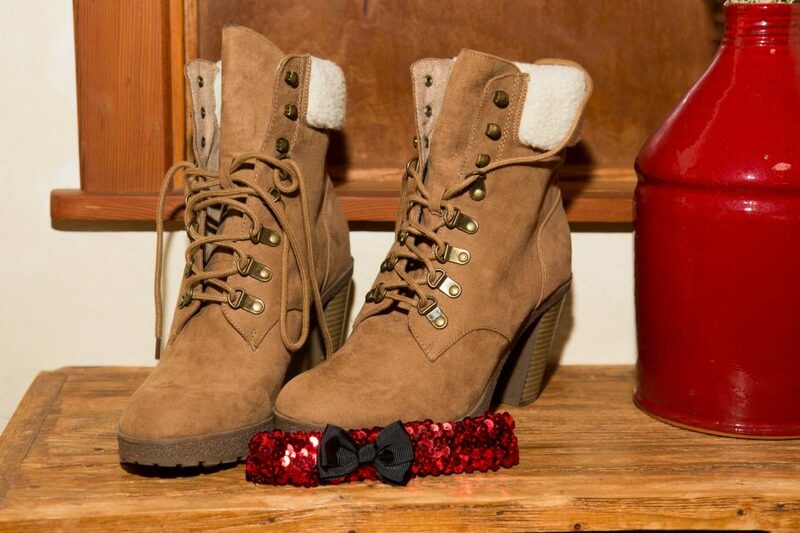 Cheers to this young couple and many beautiful autumns to come. 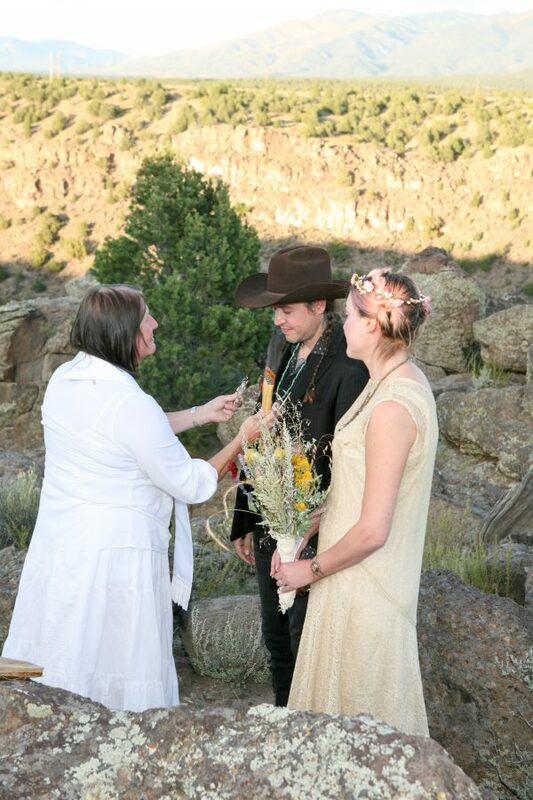 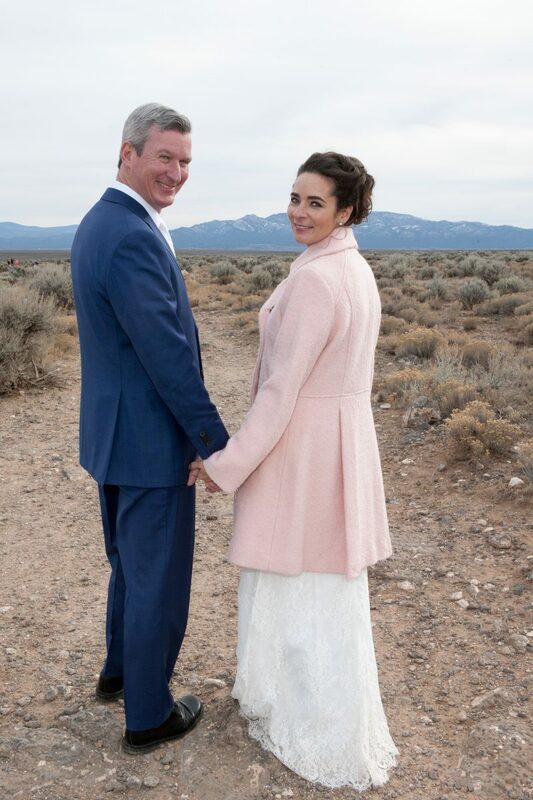 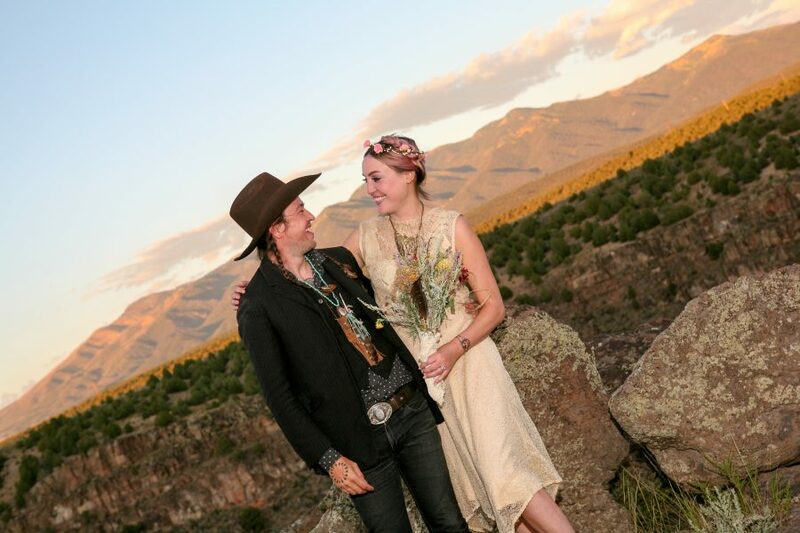 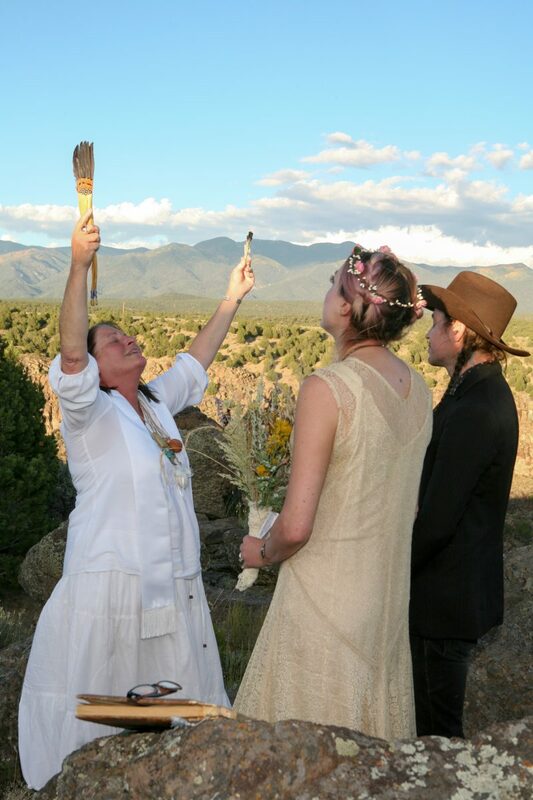 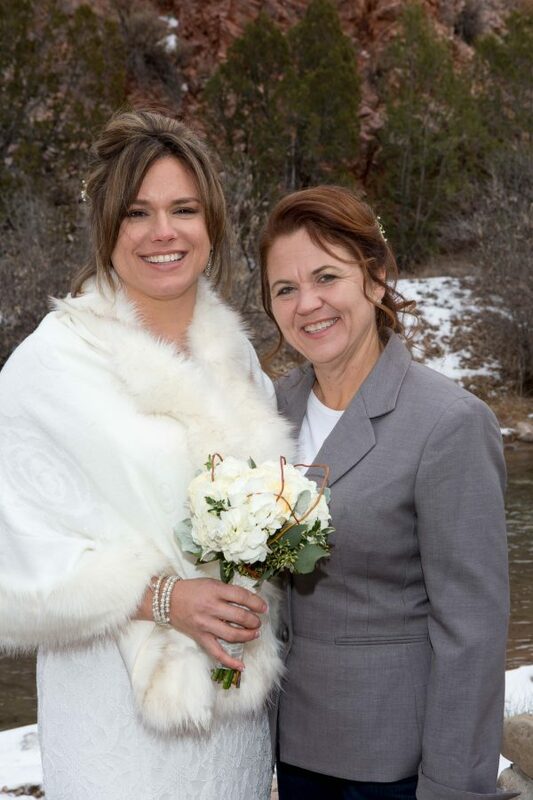 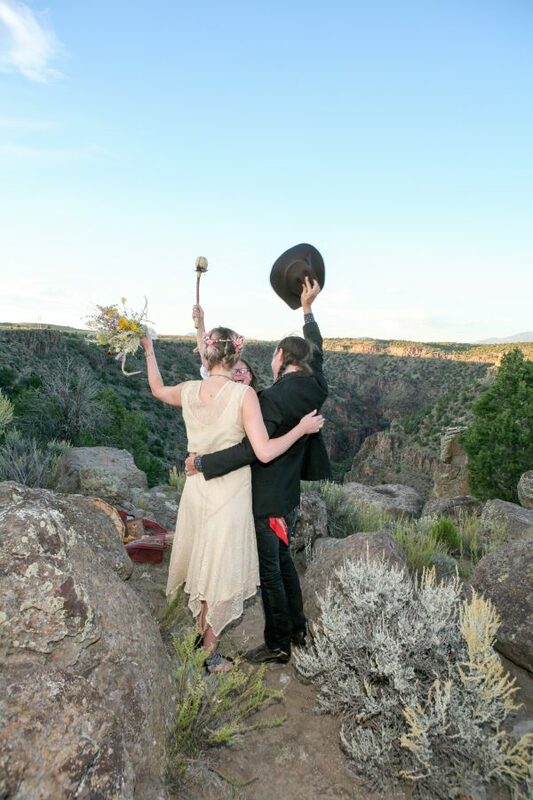 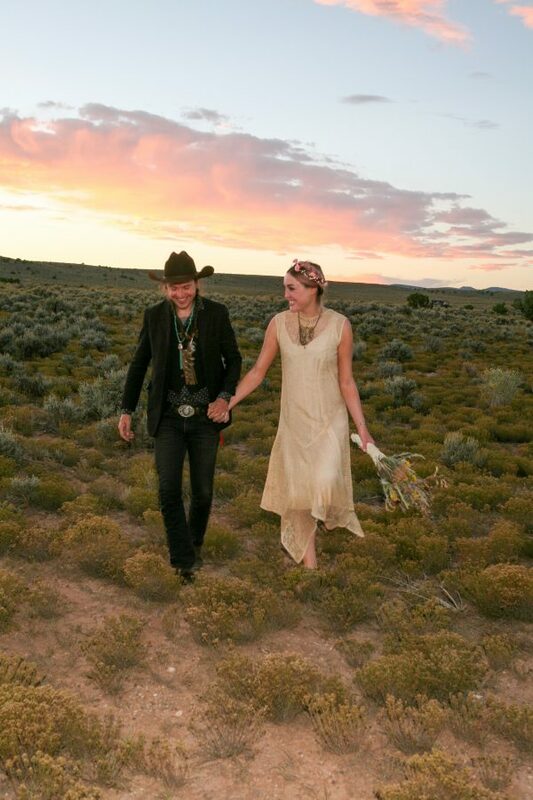 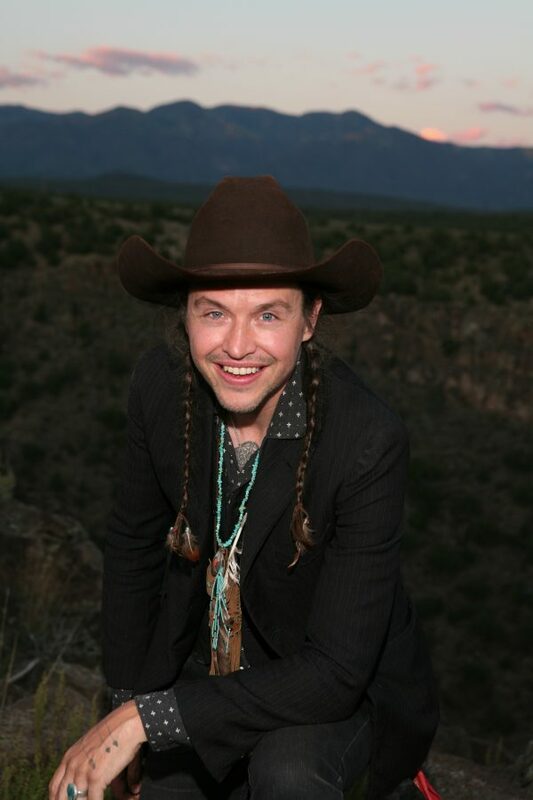 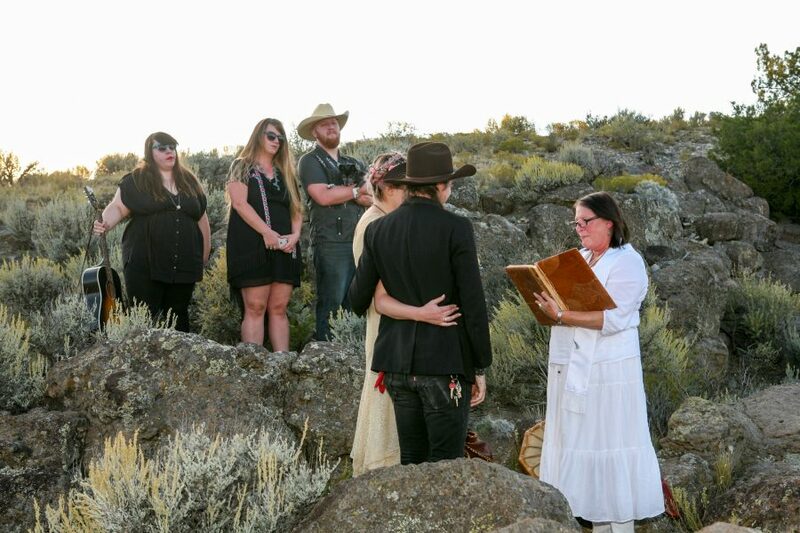 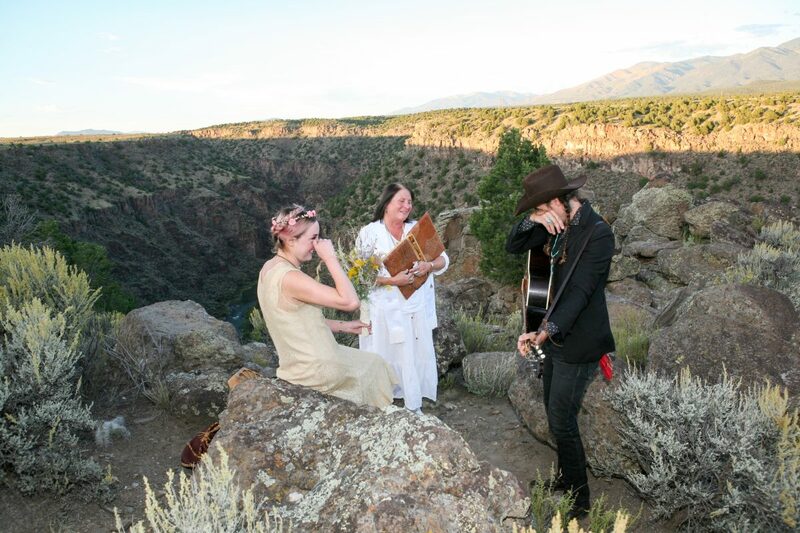 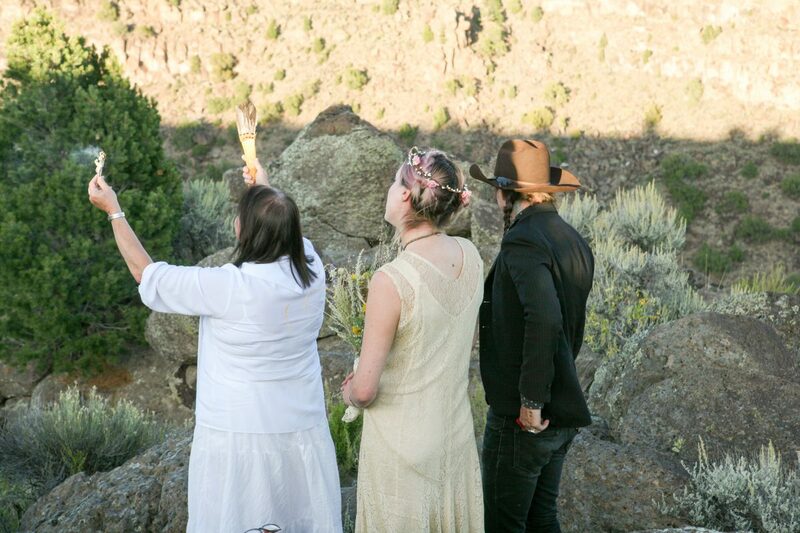 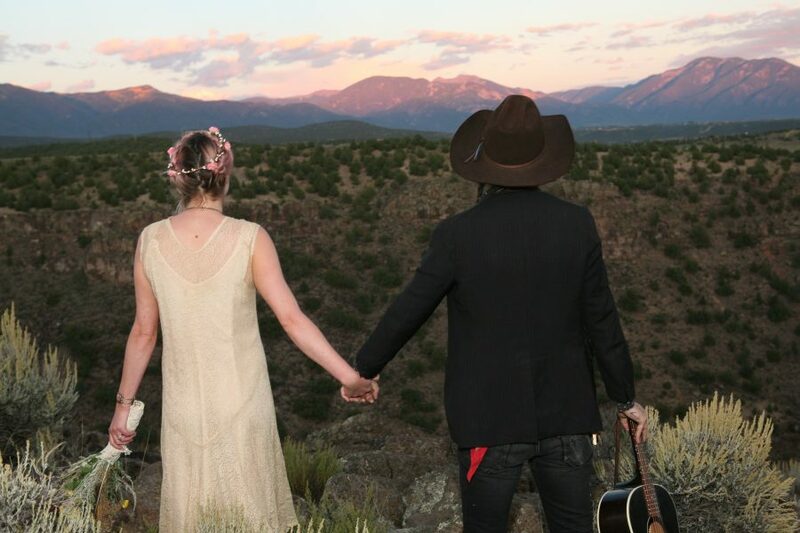 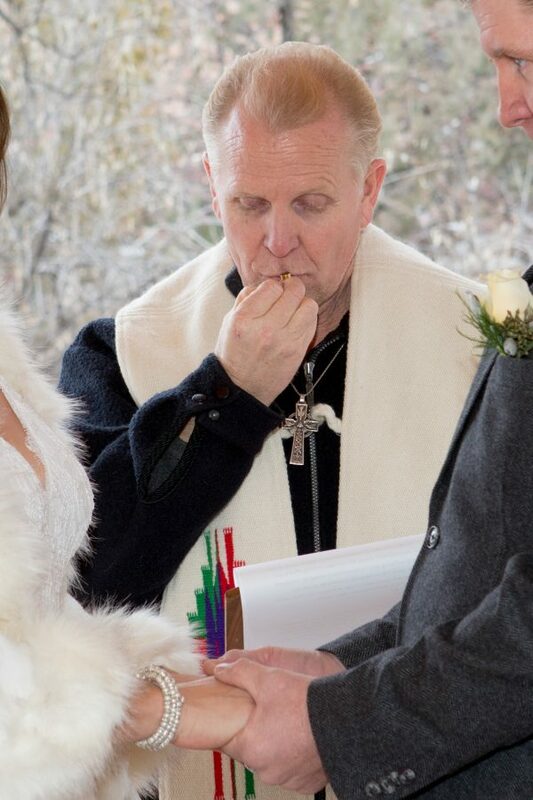 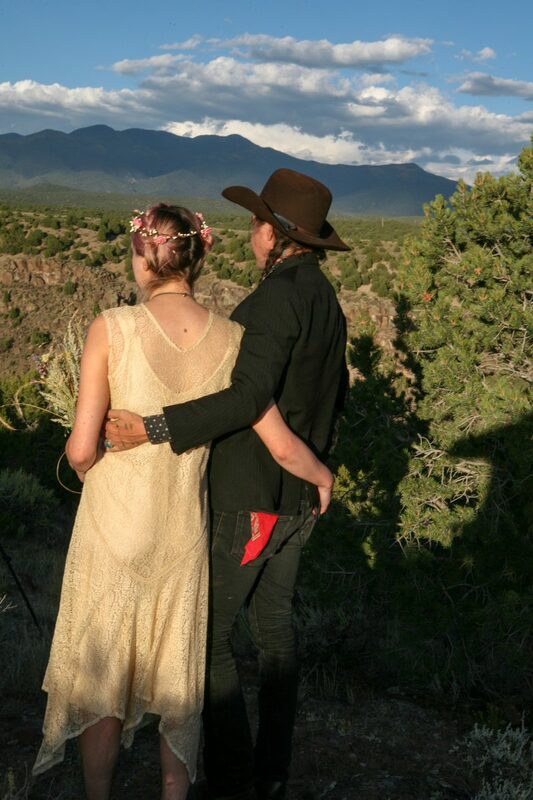 This darling couple road tripped all the way from Portland, Oregon to Taos, New Mexico to get married with Shaman, Sandra Chestnutt. 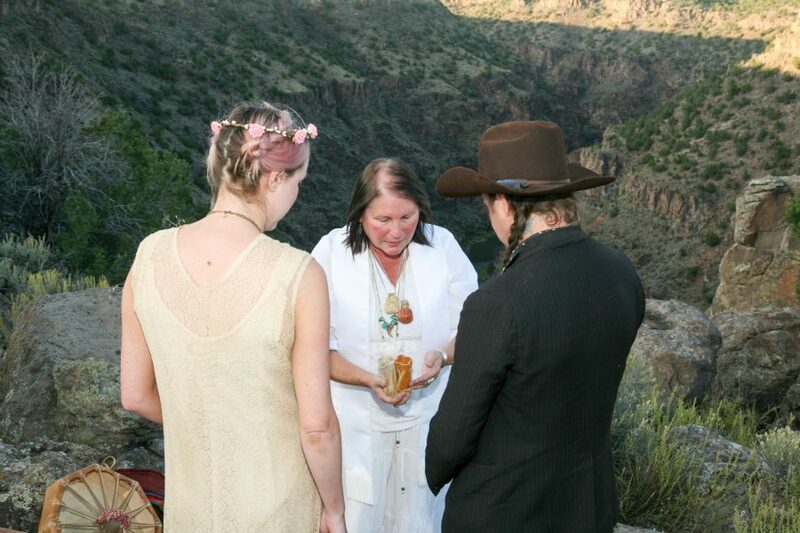 The wedding took place on the mesa in the evening before sunset. 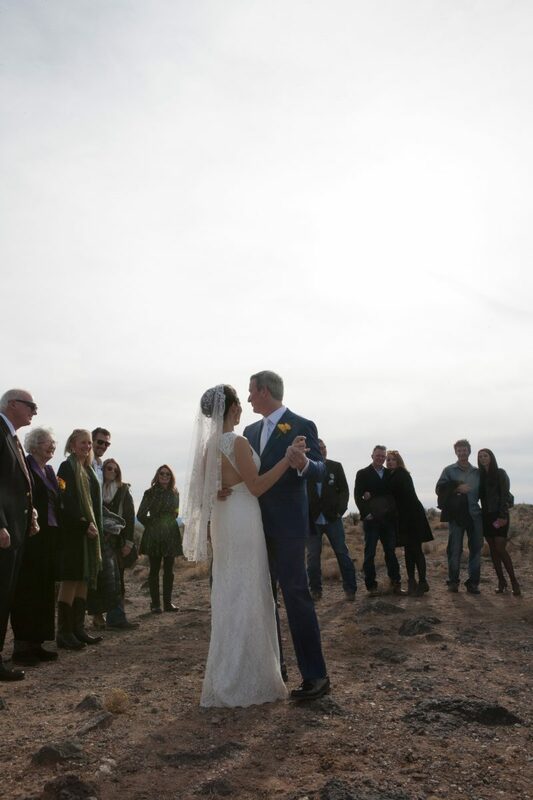 We had outstanding light and perfect weather. 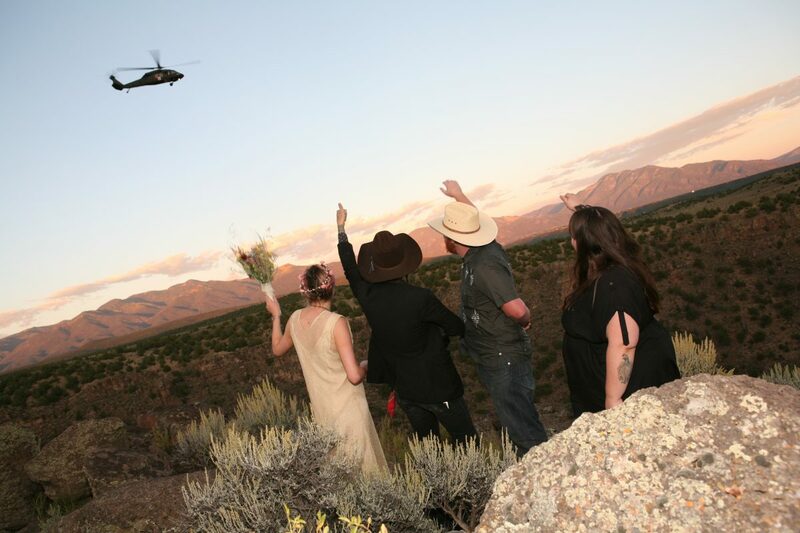 There wasn’t a person for miles and the quiet was welcomed and embraced; out of no where an army helicopter was above us and hovered above the bride and groom, and then it was gone…an unexpected congratulations! 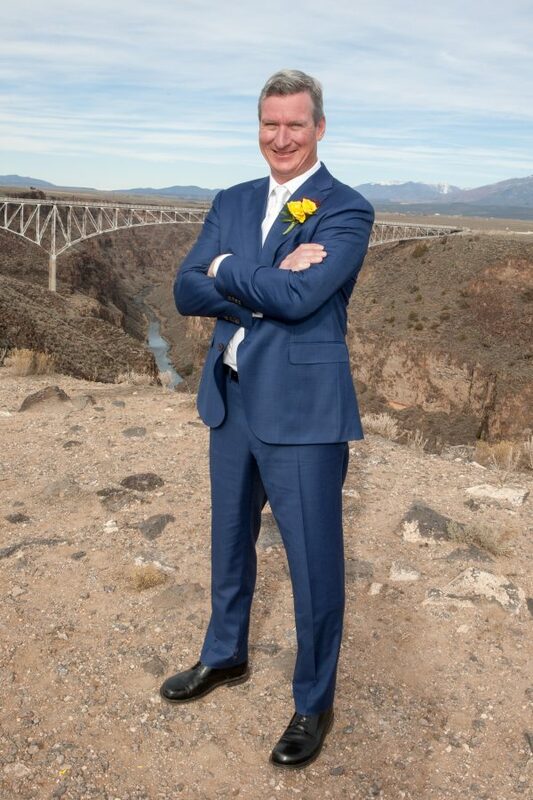 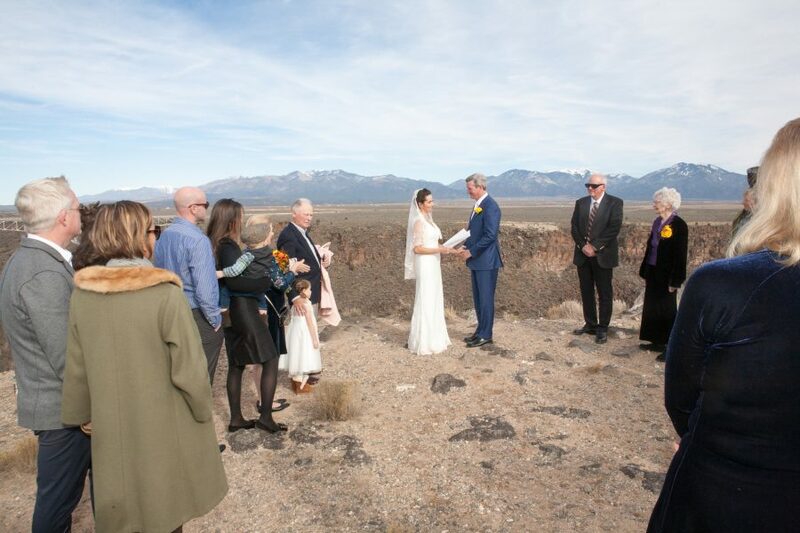 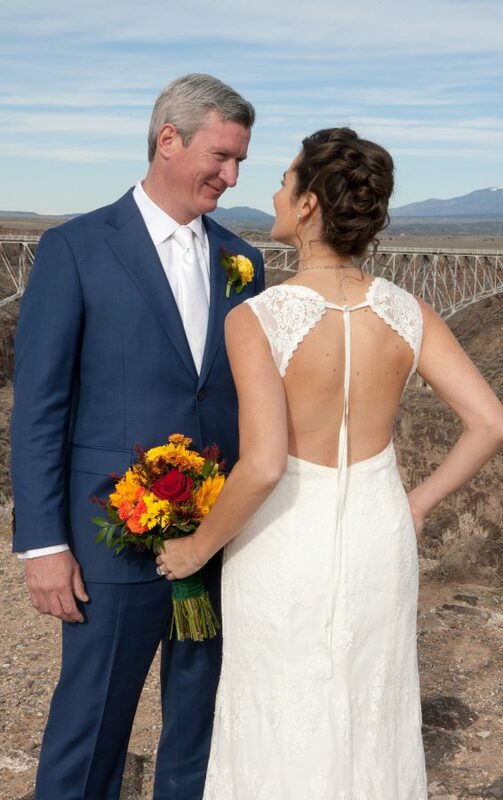 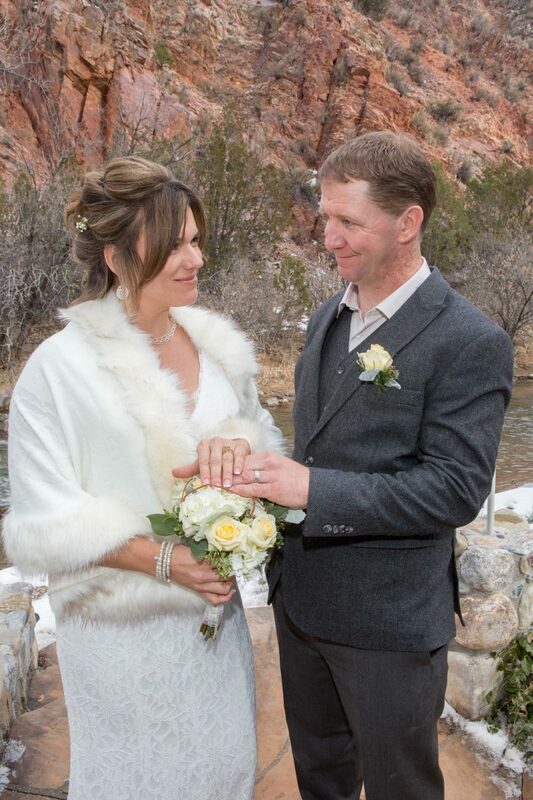 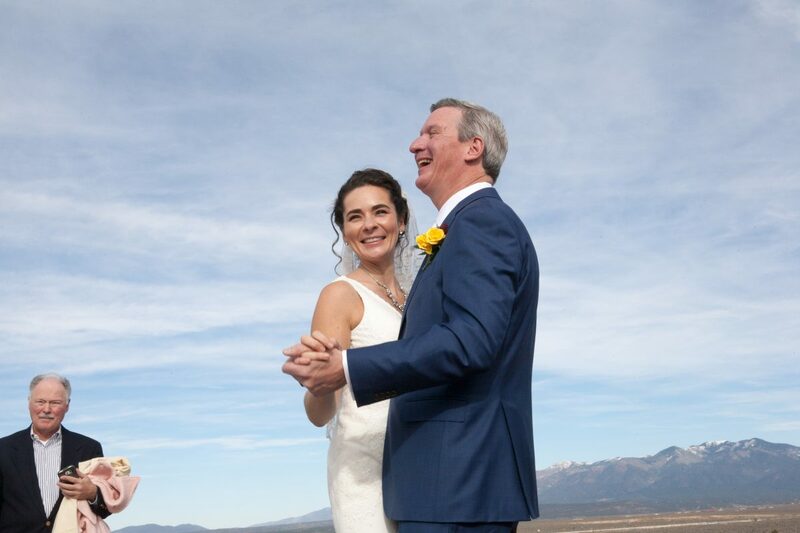 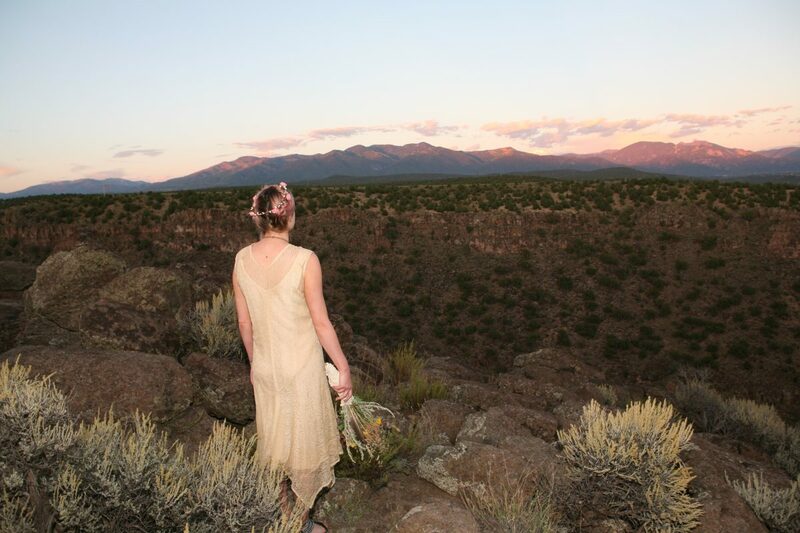 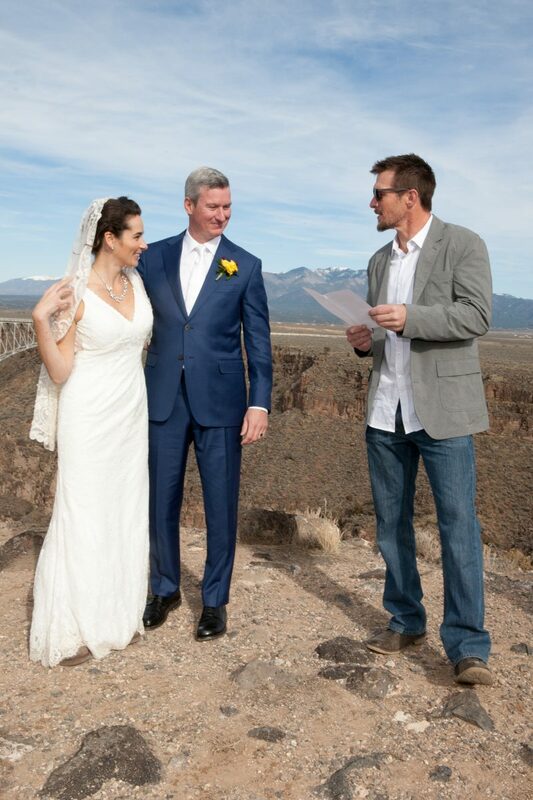 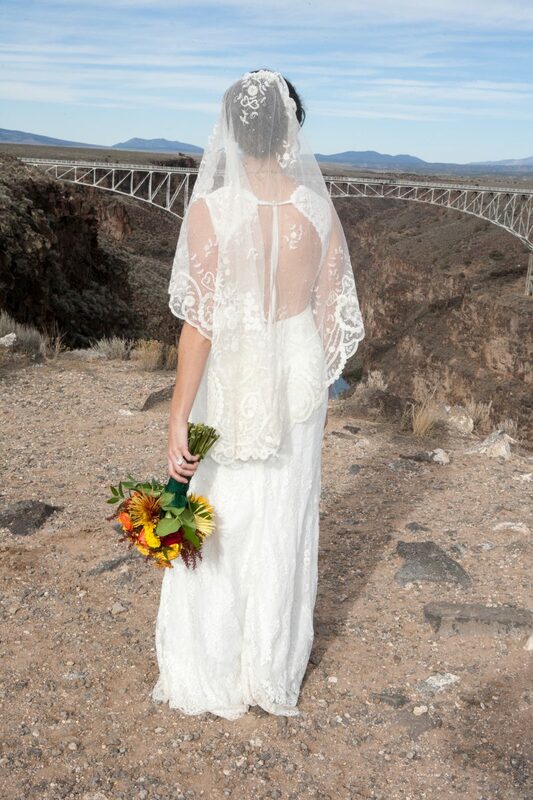 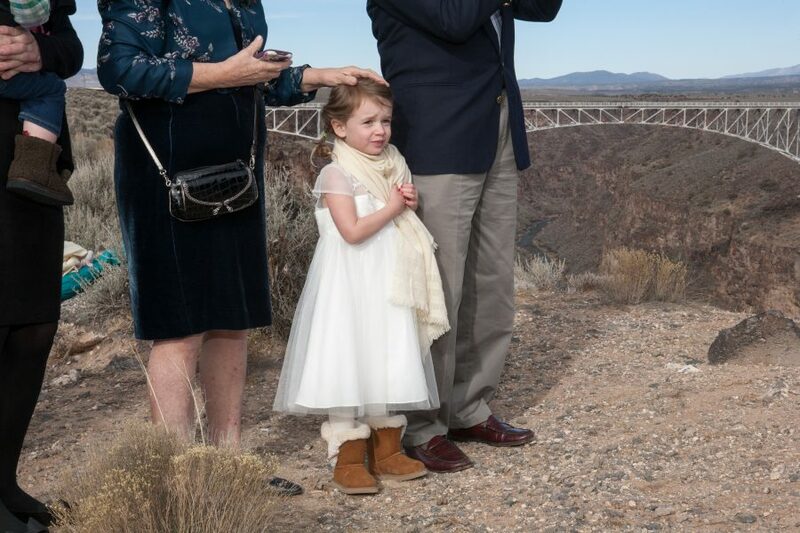 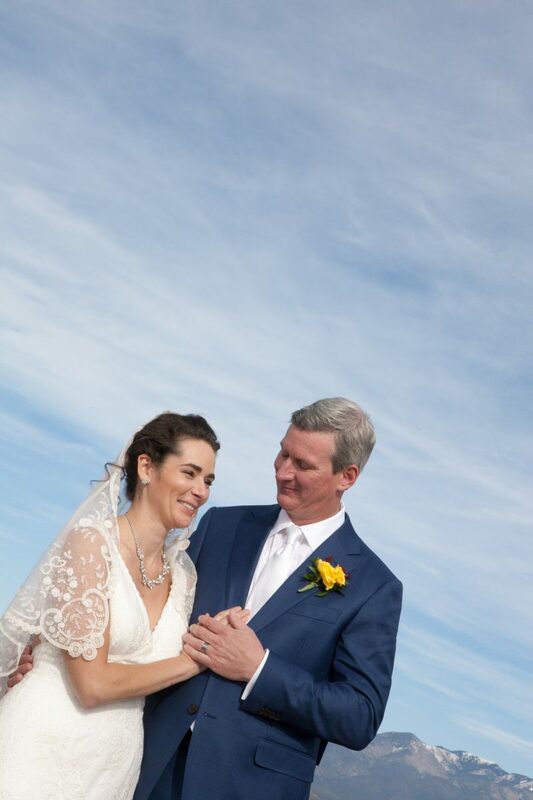 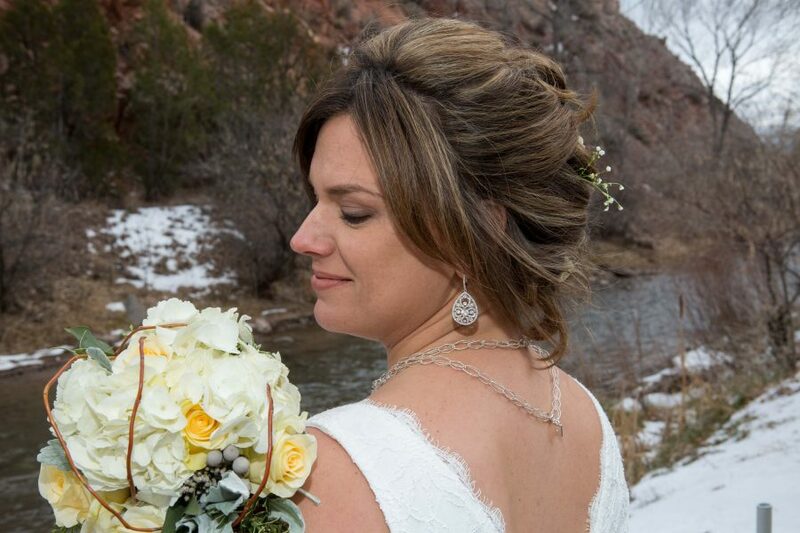 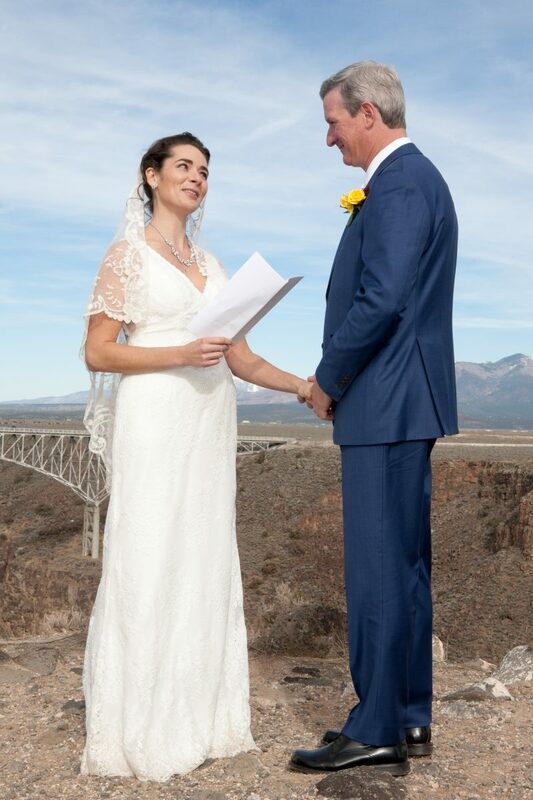 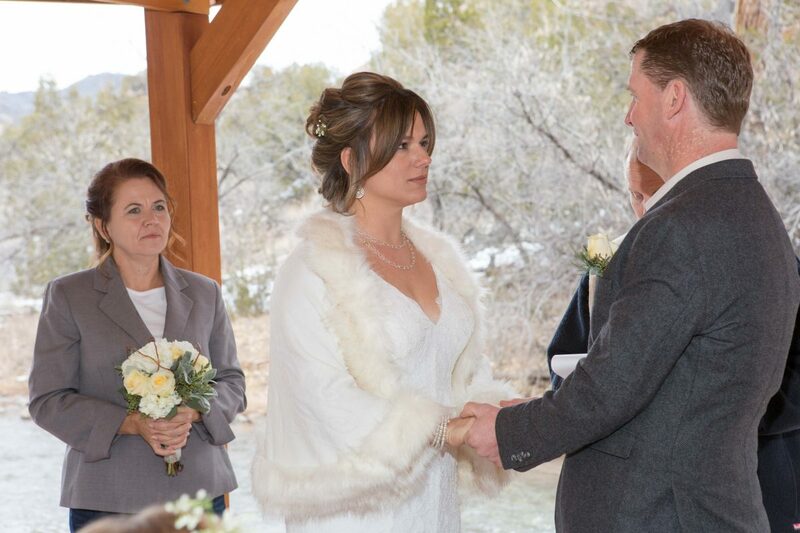 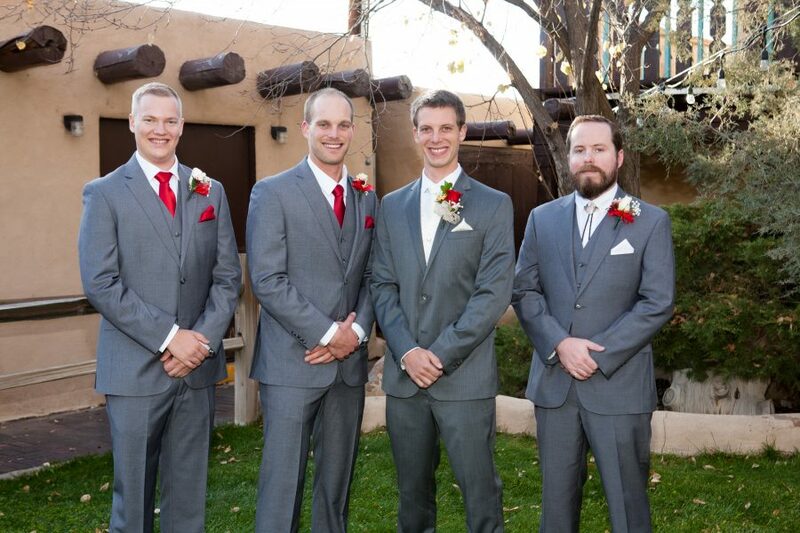 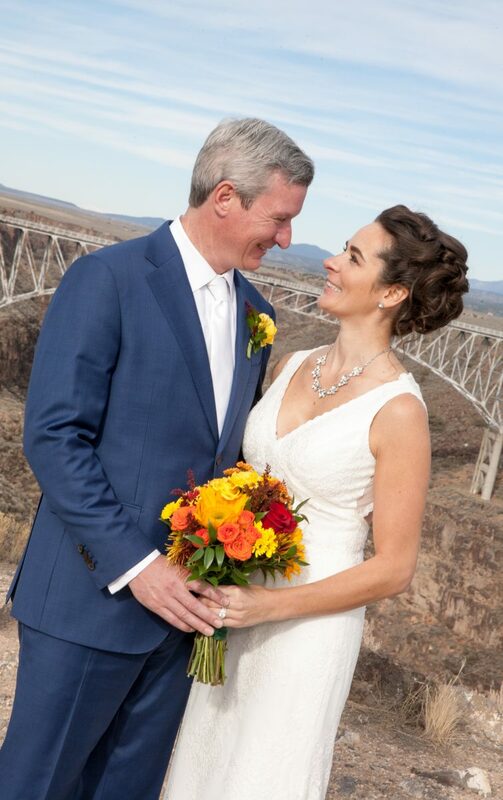 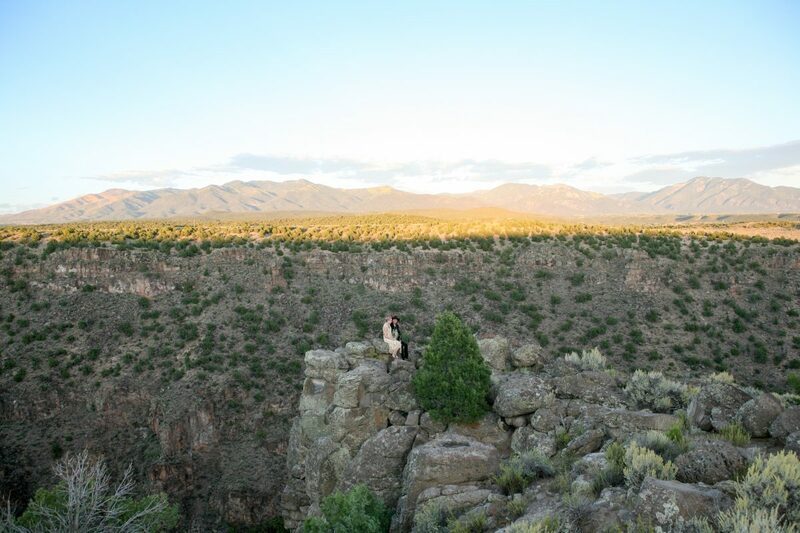 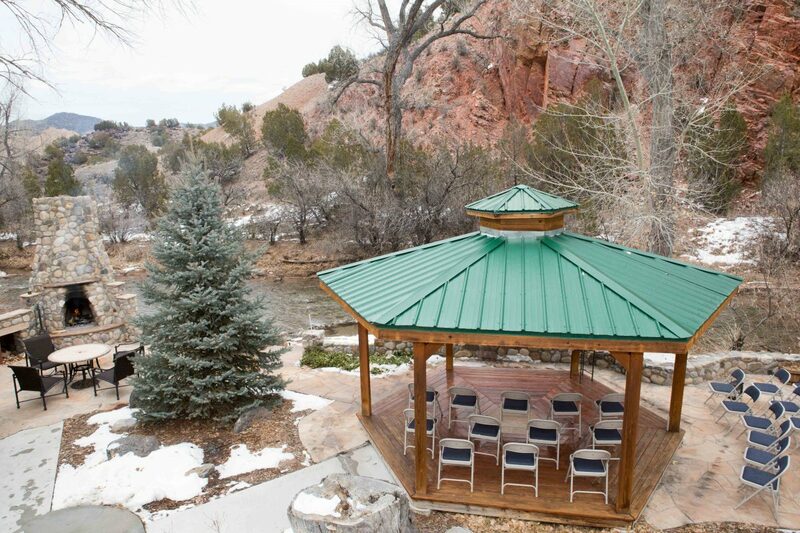 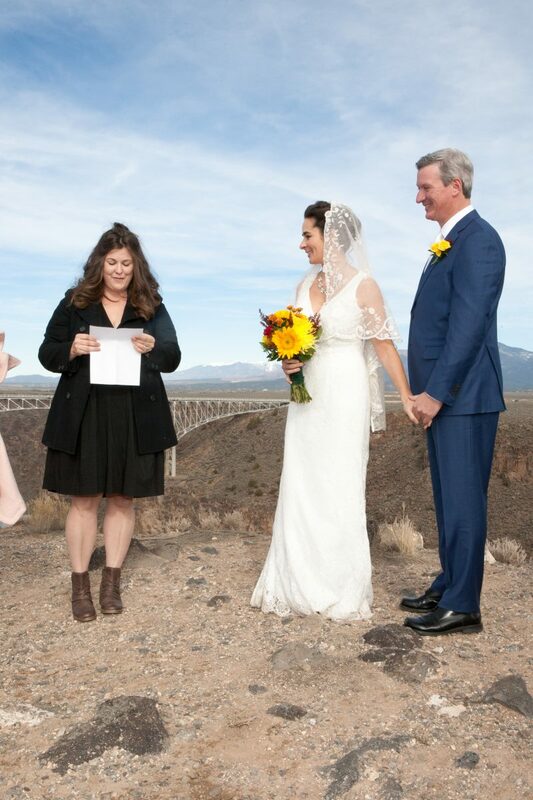 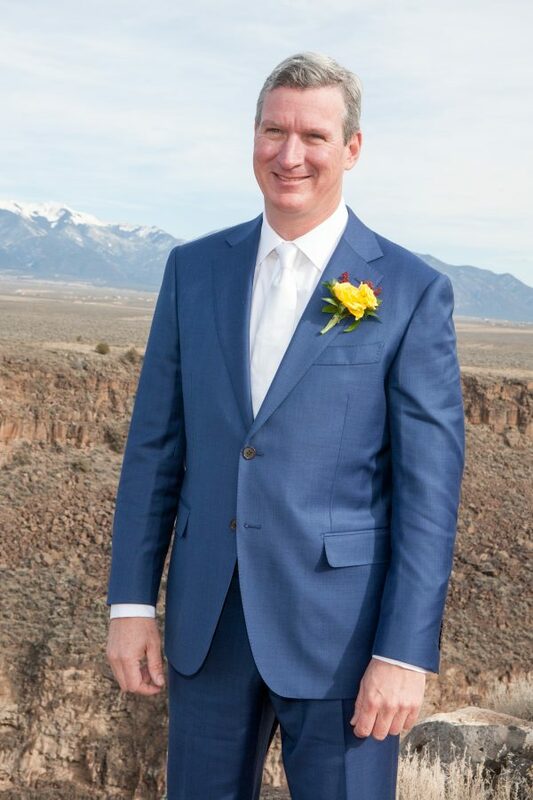 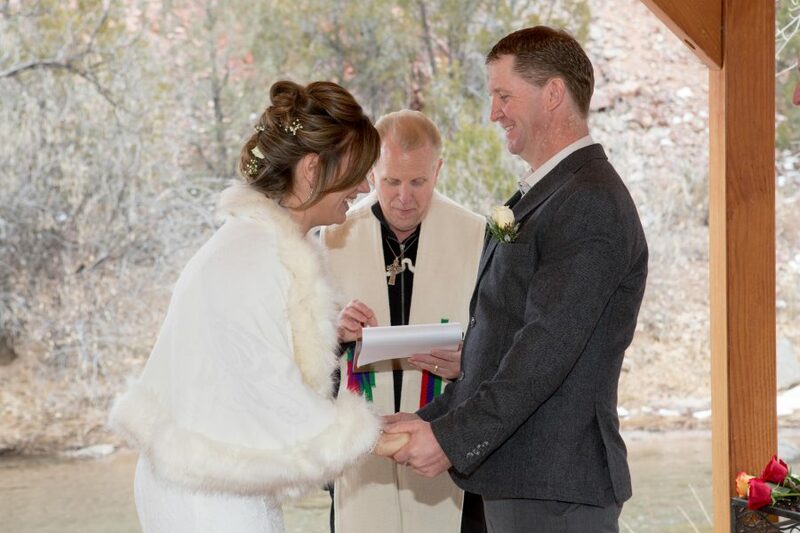 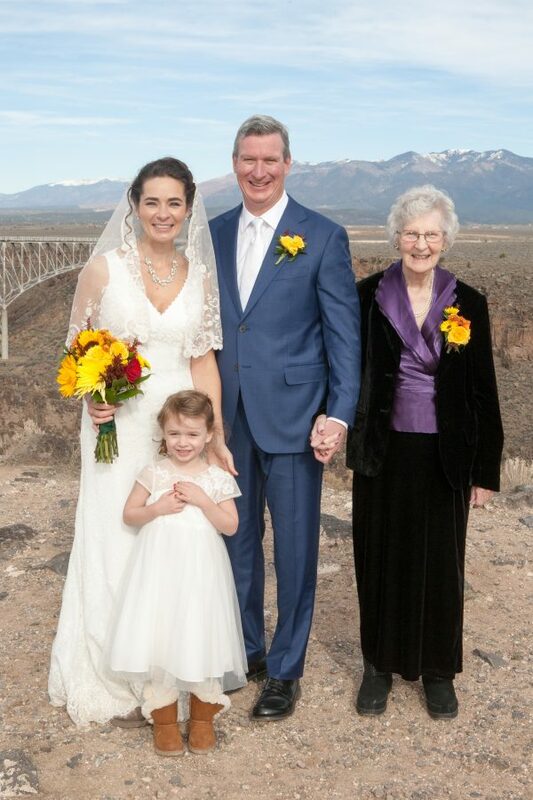 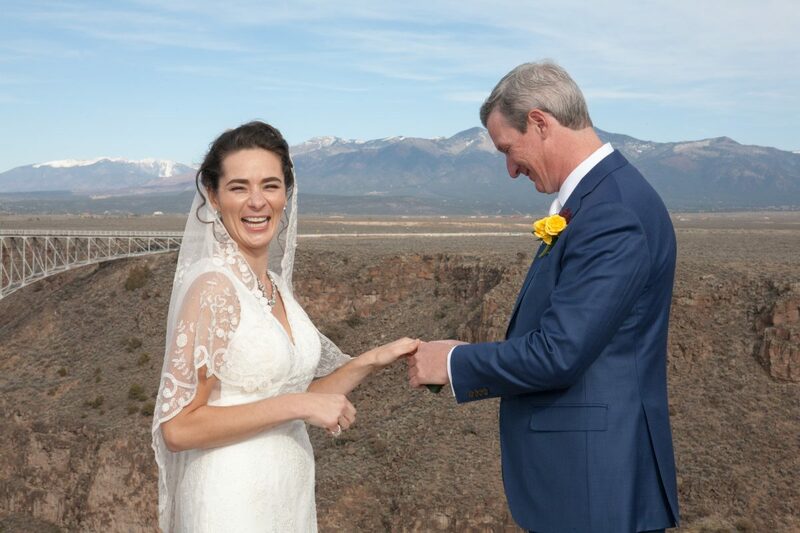 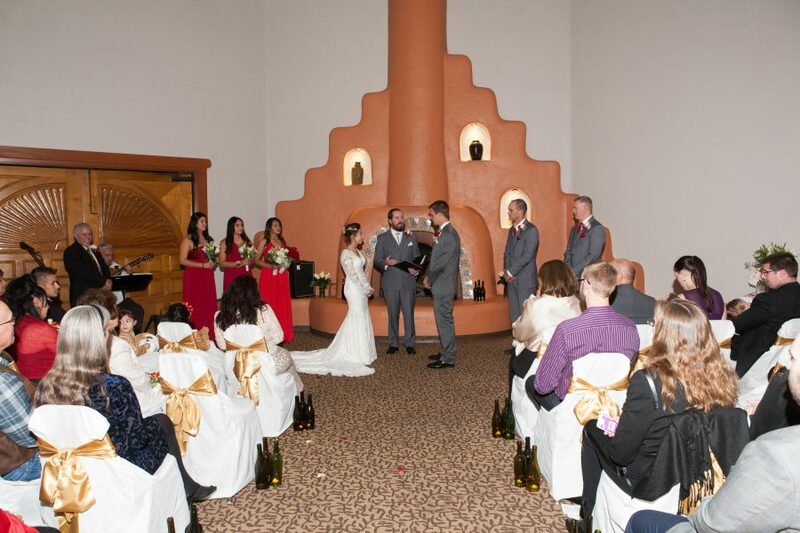 The views of the Rio Grande Gorge were stunning and the ceremony was memorable. 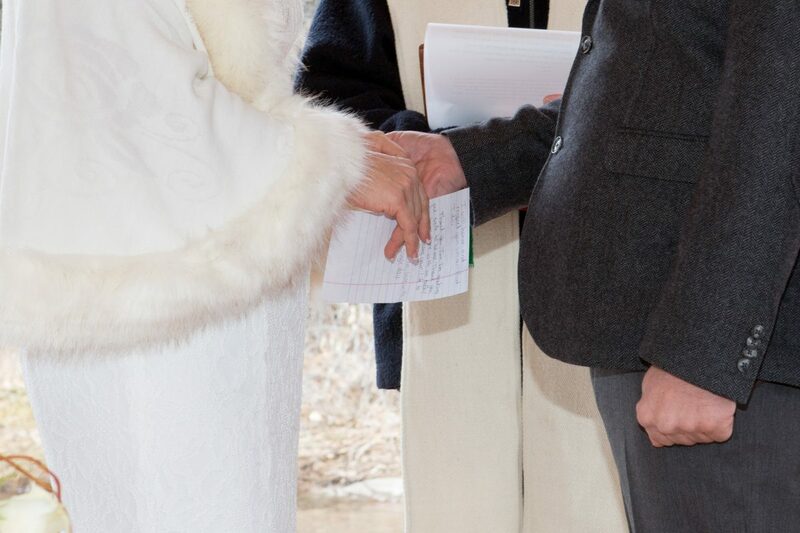 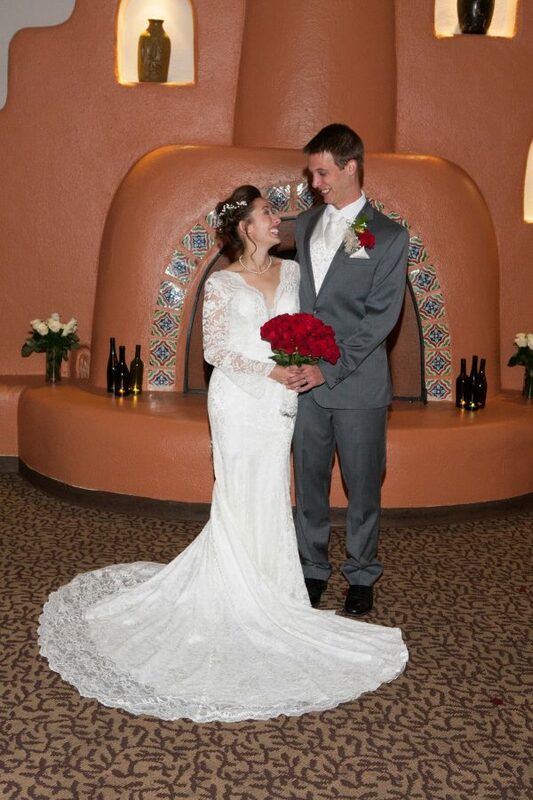 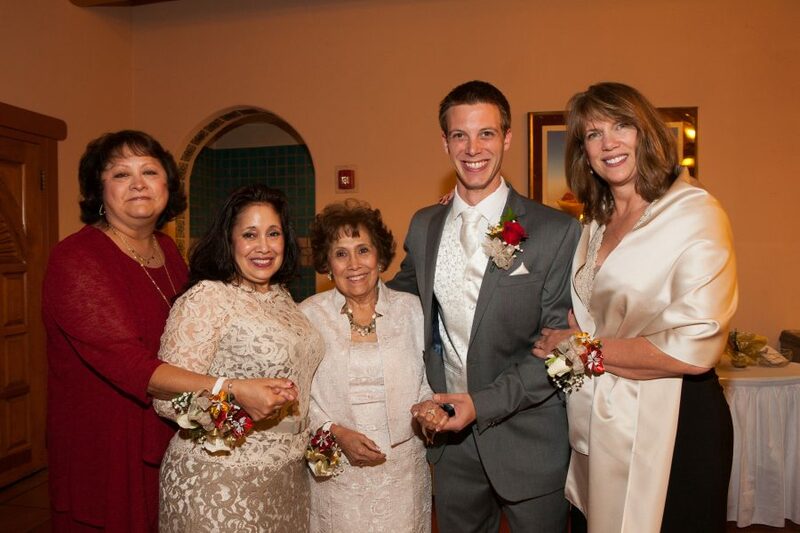 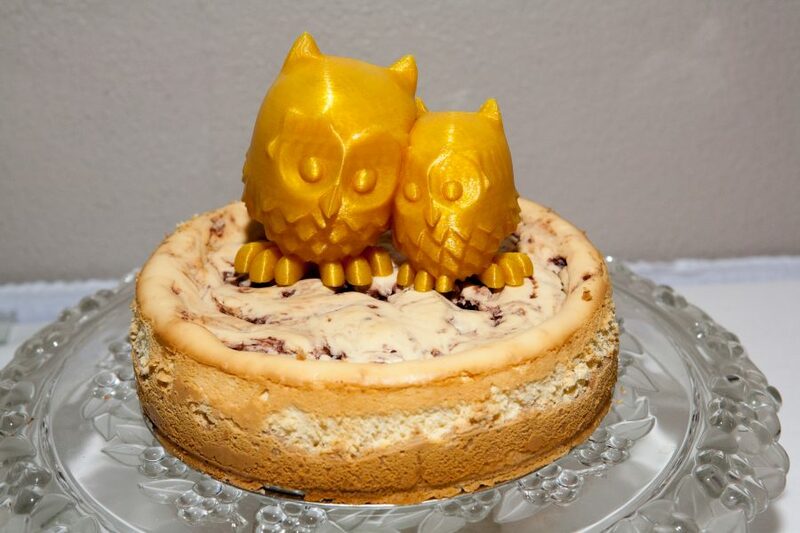 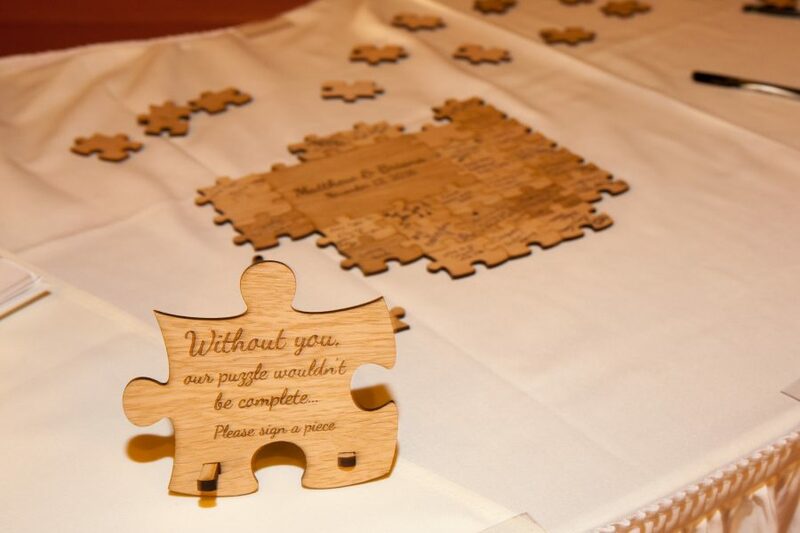 Congratulations to Lisa and Evan, a delightful pair who will no doubt live happily ever after.